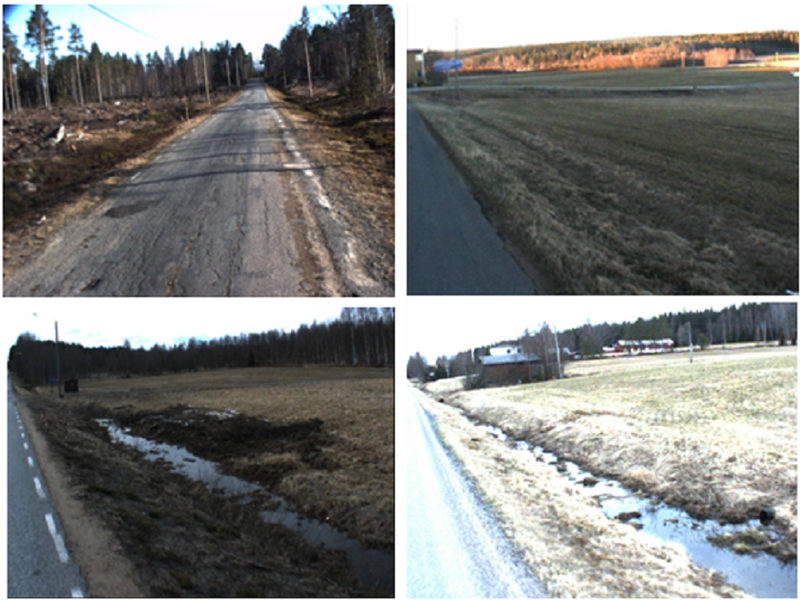 The ROADEX IV project carried out a number of drainage analysis demonstration projects across the ROADEX partner areas in 2010 – 2011 and the results of these projects provide an excellent overview of the drainage problems in each area. 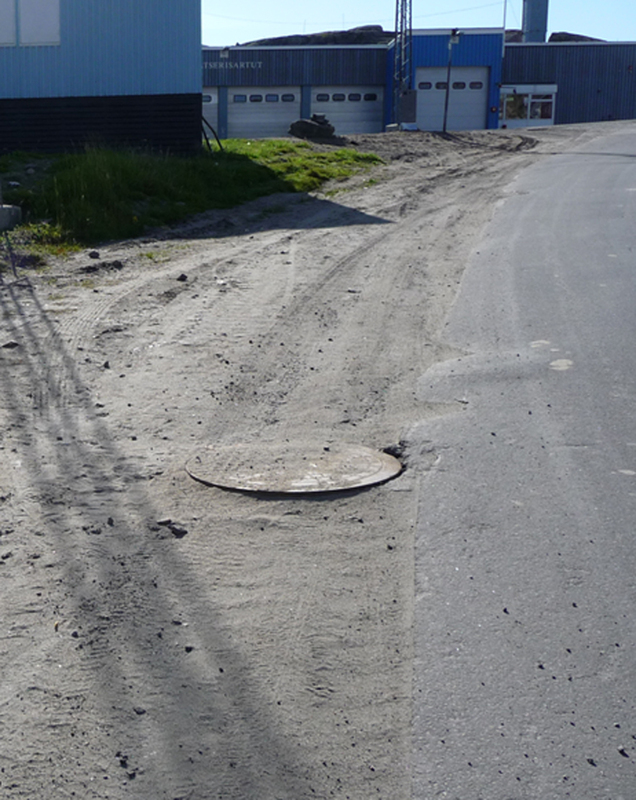 As already mentioned in earlier chapters, poorly performing drainage is a common problem across the ROADEX area and to deal with this each country has developed slightly different practices to meet their particular topographical conditions, soil types, climate, road construction and maintenance history. This lesson will present a summary of the ROADEX work carried out and give typical drainage problems in each ROADEX area. The countries are presented in alphabetical order. 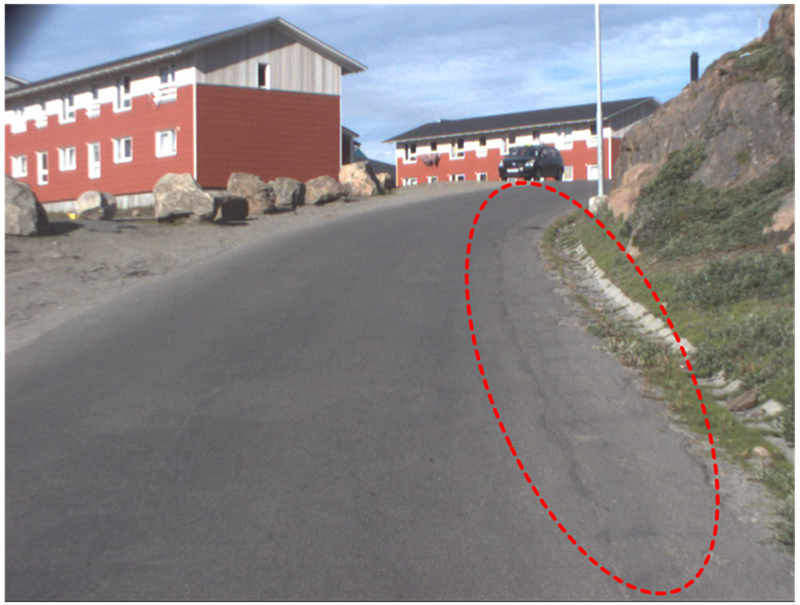 Examples of the drainage classes used in the in drainage analyses in Sisimiut in Greenland are shown in the following figures. 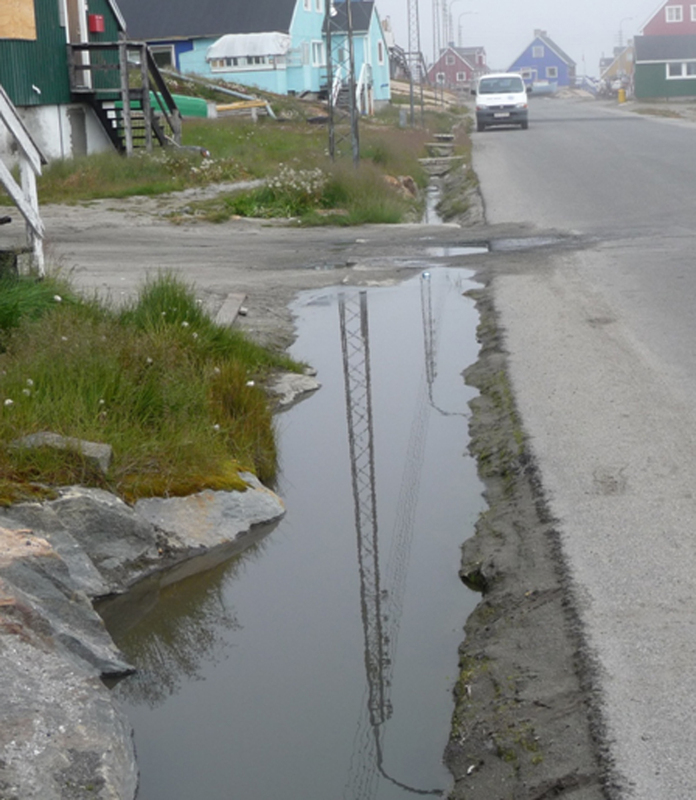 In general drainage is in adequate condition in the Sisimiut urban area. 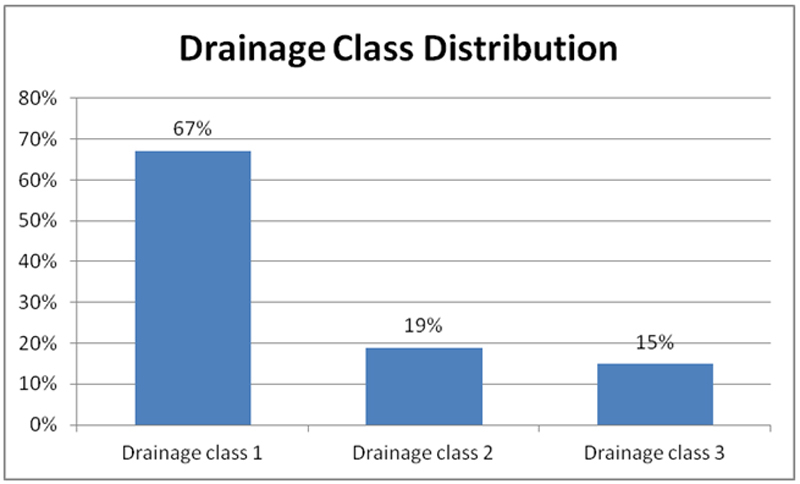 Roughly 41% of the surveyed chain age was classified as drainage Class 1, whilst 27% was classified as drainage Class 3 (severe drainage deficiencies). 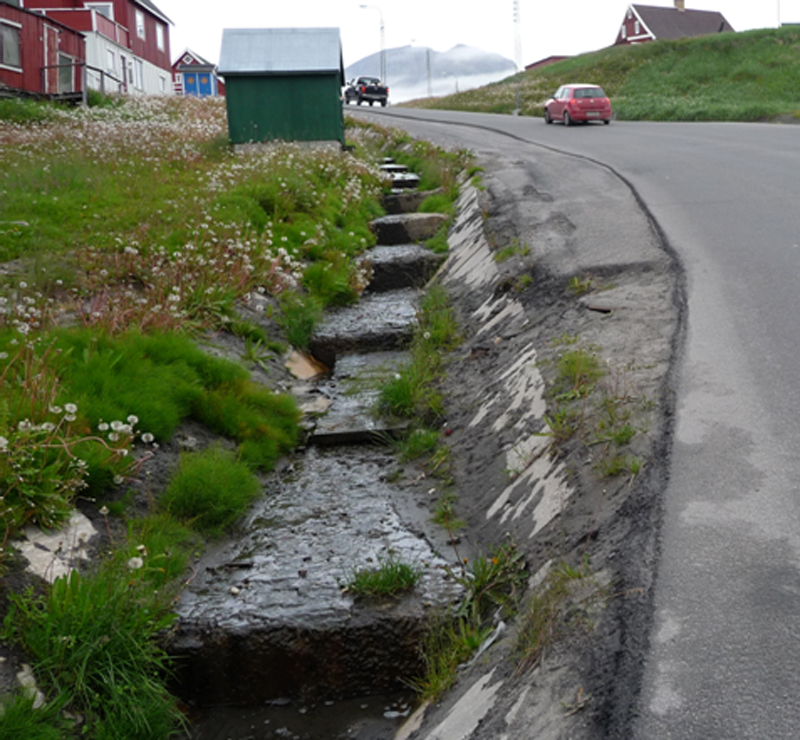 The main drainage problem in the urban area of Sisimiut is with the upper side ditch in side sloping ground. In some slopes the ditch is too shallow, or otherwise ineffective, and in some cases there is no drainage system at all. Some of the access road culverts are clogged with soil and rubbish. In most cases these culverts just need cleaning out, but their condition should be checked and the culvert replaced with a new one if necessary. Some street sections do not have a drainage system at all. In these cases any water on the pavement or in the pavement structure does not have a drainage exit path and sooner or later the trapped water will form frost damages. This will be especially the case in some of the road cut sections. 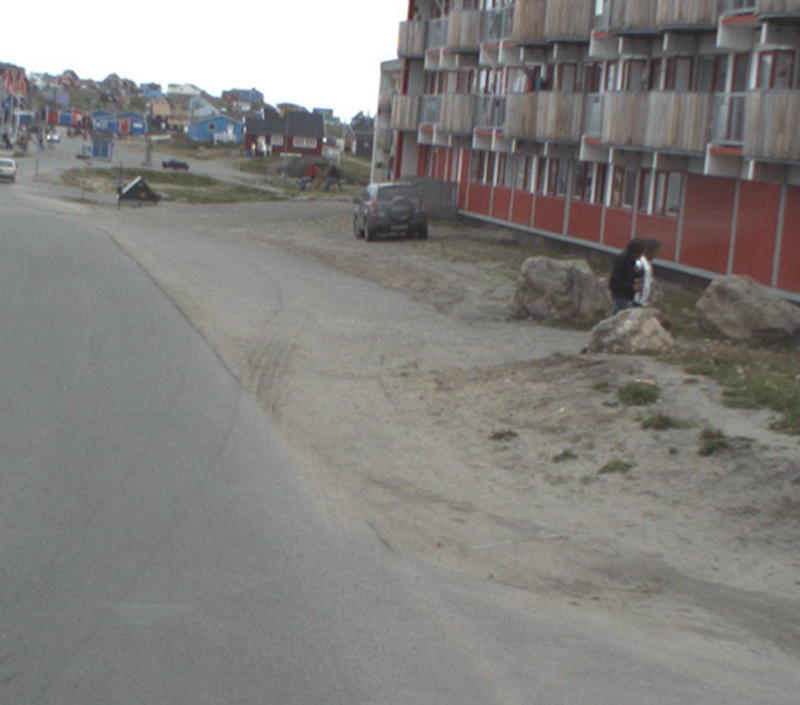 Concrete ditches have been constructed as side drains in the streets of the Sisimiut town centre area . 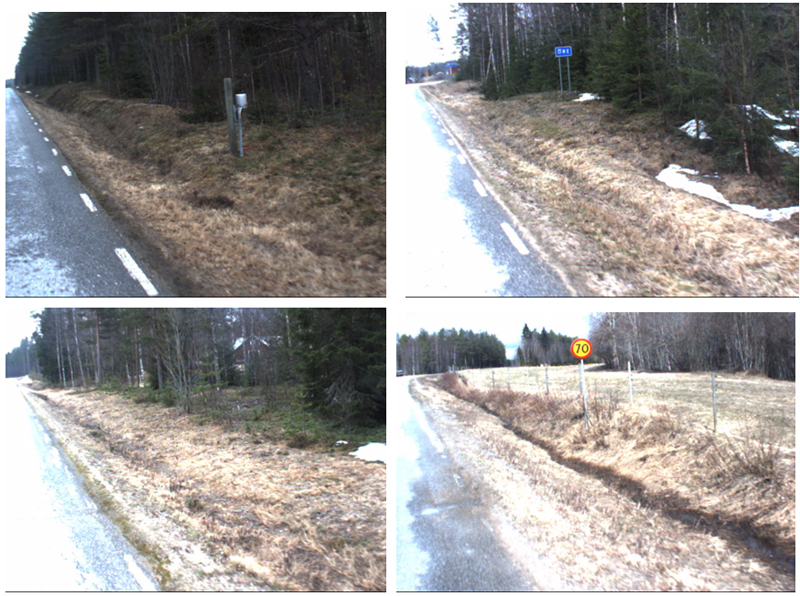 Most of these ditches work quite well but some are broken and should be cleaned and repaired. 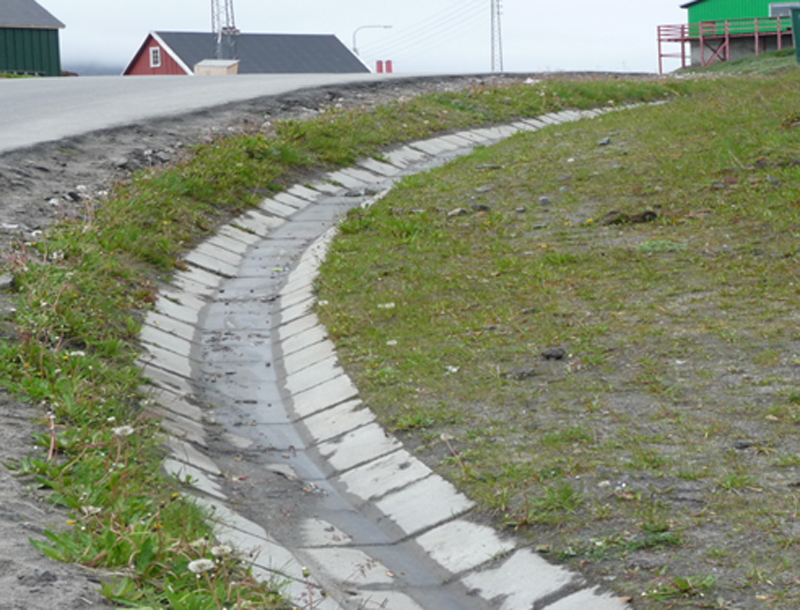 A clever drainage solution has been developed for steeply sloping streets located in Sisimiut. Concrete steps have been provided in the bottom of the ditch to make the water run down the steep slopes more gently. 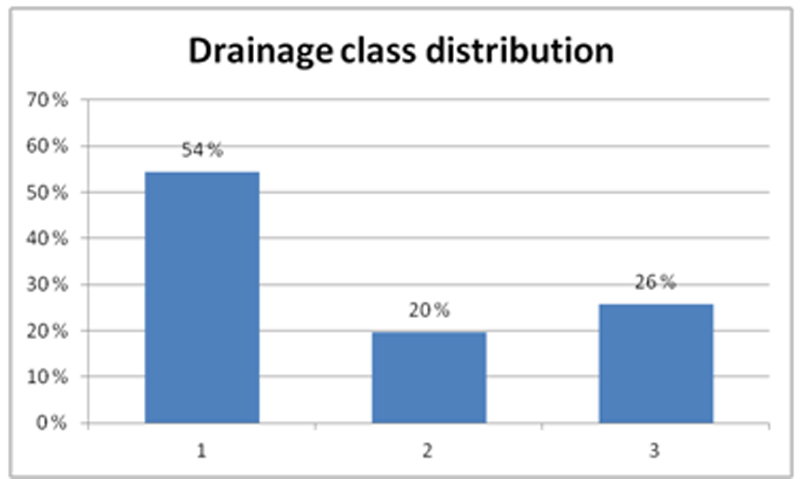 Examples of the drainage classes used in drainage analyses in Finland are shown in the following figures. 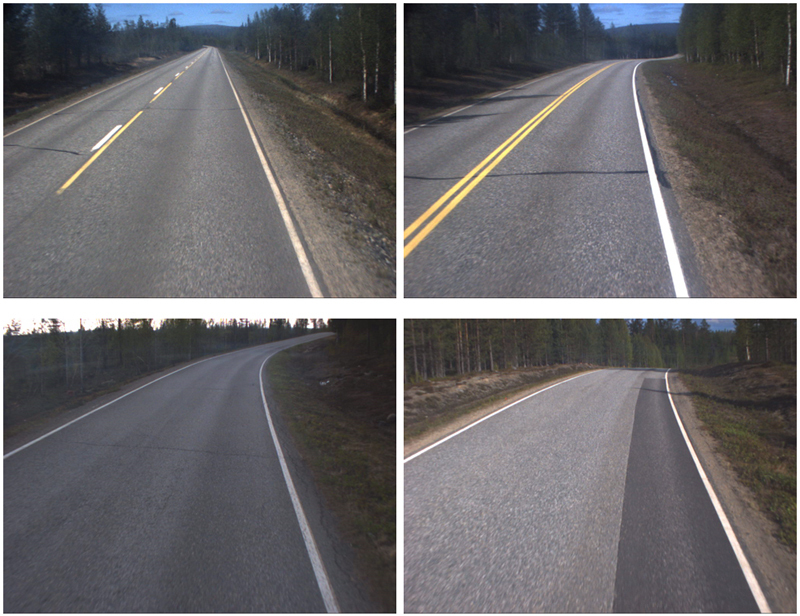 As with other countries, the main drainage problems on the Finnish road network are generally related to the road cross-section profile. 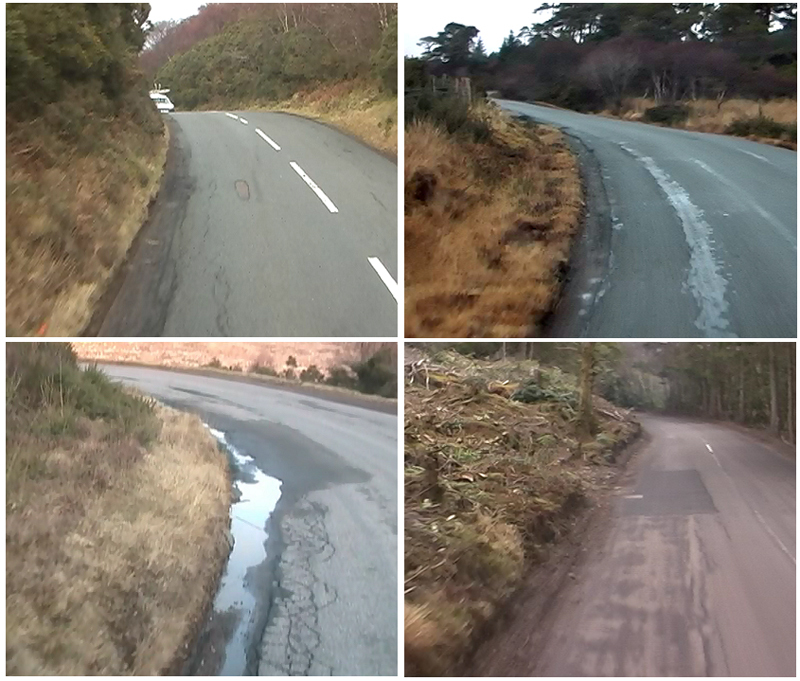 Of these the most challenging sections are roadside ditches on the inside cut face on sloping ground and in road cuts. “Flat and even areas” can also pose drainage difficulties in areas where there is a risk for flooding. 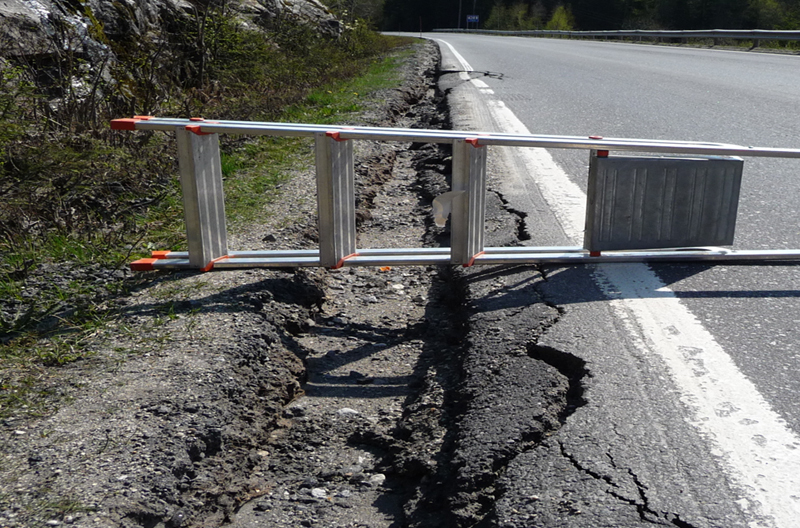 This can saturate the road structures and lead to permanent deformation problems. 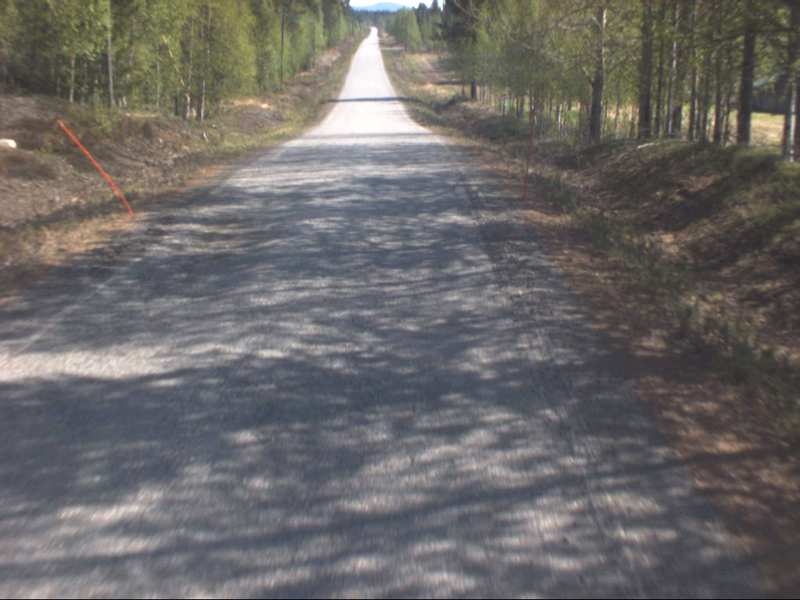 Private access road culverts are particular cases in Finland. 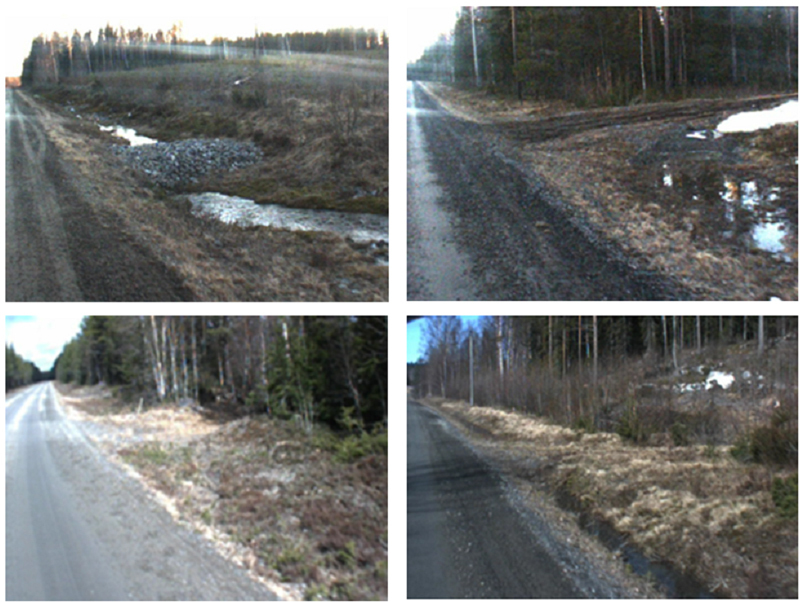 As mentioned in previous lessons the maintenance responsibility of these culverts in Finland belongs to the owner of the access road. This can cause difficulties as frequently these private road owners ignore their responsibility for keeping the culvert clean. Quite often these culverts are also poorly built, are too small or they are totally missing. This creates blockages in the road drainage system and leads to damages in the main road. 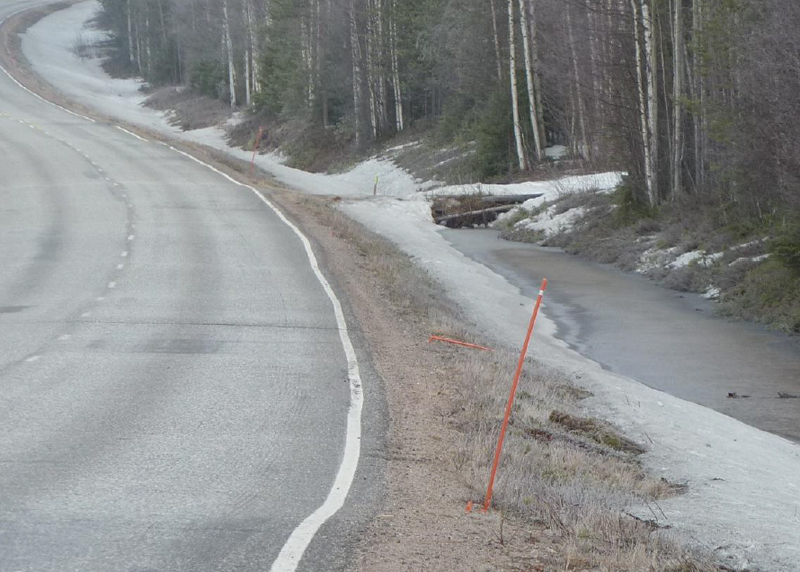 Several drainage analyses have been carried out in northern Finland over the years and there is now a good general awareness of the importance of drainage condition, and the different types of problems that can arise if the road drainage is allowed to deteriorate. The work especially focused on better drainage maintenance, and on follow up monitoring to check the continuing drainage condition . 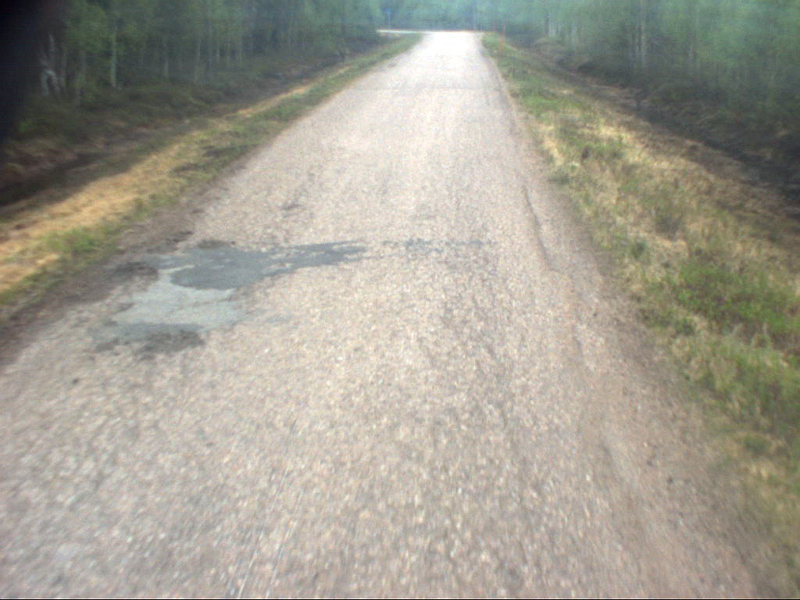 This has been documented in the ROADEX IV project in the Rovaniemi and Kittilä areas. 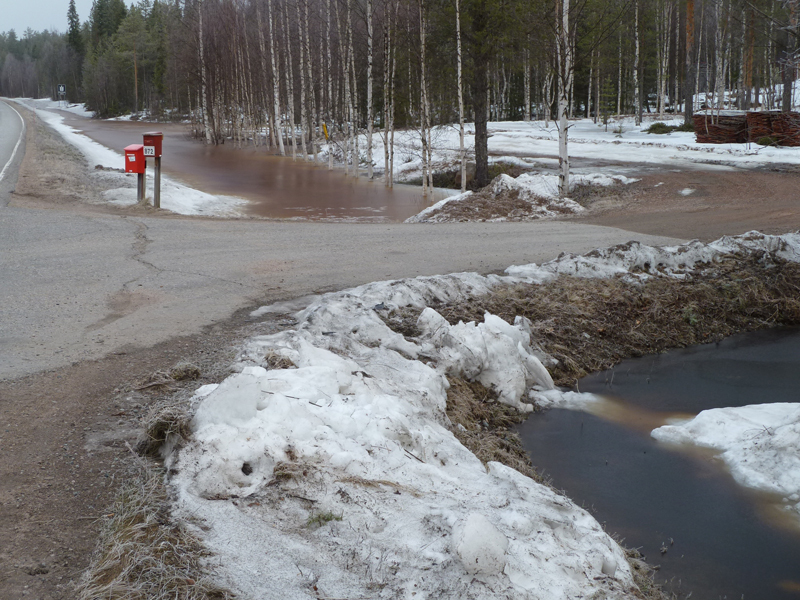 In the Rovaniemi area, the follow up surveys showed that only 41% of the drainage in the special maintenance sections was faultless. The defects were however minor, with severe problems only detected on a 154m long section (i.e. 2% of total length). The deficiencies identified were mainly a result of collapses of outer slopes into the ditch bottom that restricted the flow of water. In some cases the problem was an inadequate longitudinal gradient. 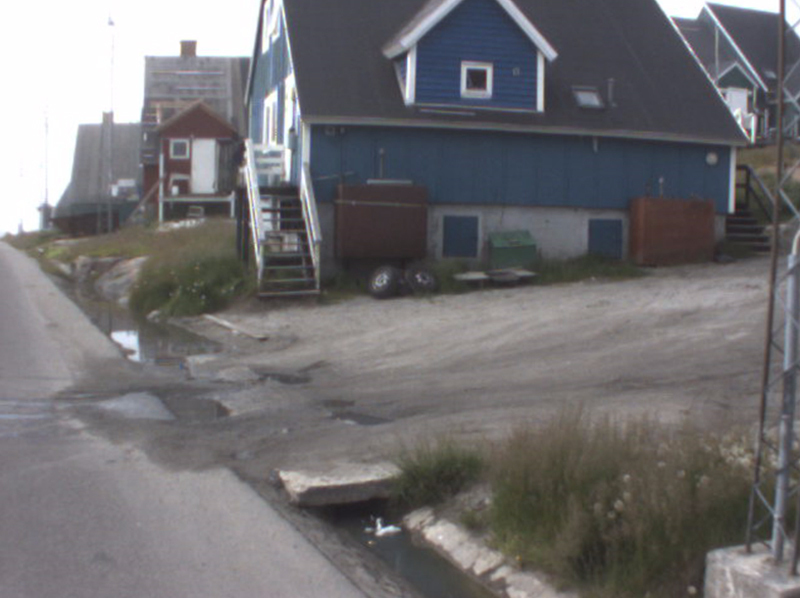 One special observation made was that the maintenance contract guidelines did not require the sheet ice to be removed from the ditch until water started to flow on to the pavement. This is too late and will cause major problems to the road if allowed to happen. 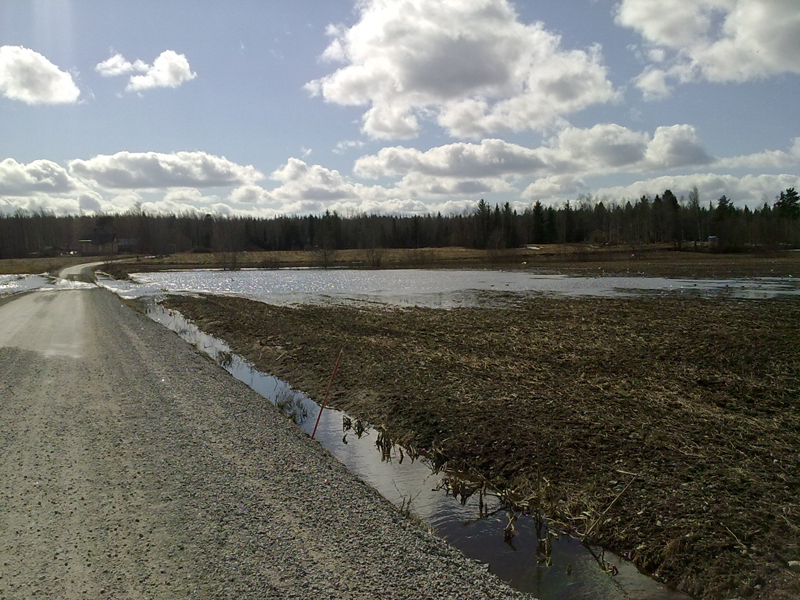 The Kittilä area follow up project for drainage maintenance showed that only 35% of the special maintenance sections had faultless drainage. Minor deficiencies were observed on 25% of the surveyed length. 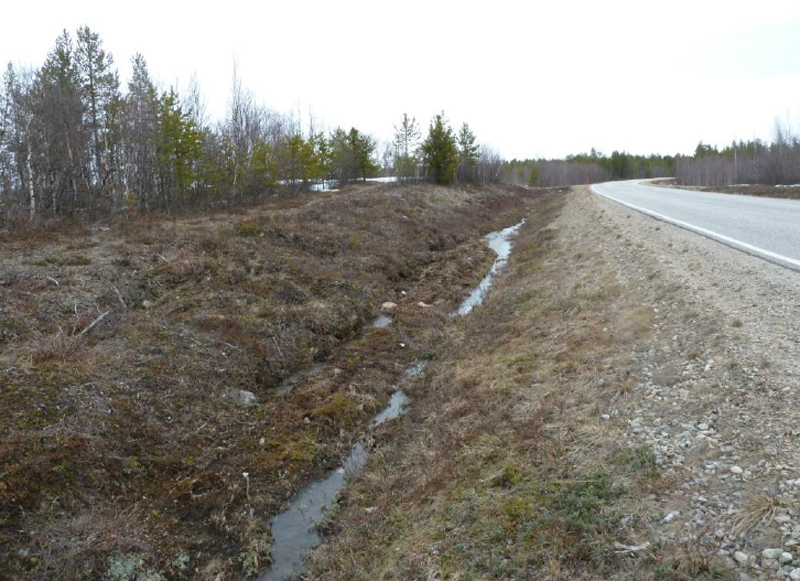 The reasons for these defects were, as in the Rovaniemi area, that soils on the outer slopes had collapsed into the ditch bottoms and restricted the flow of water in the ditch. 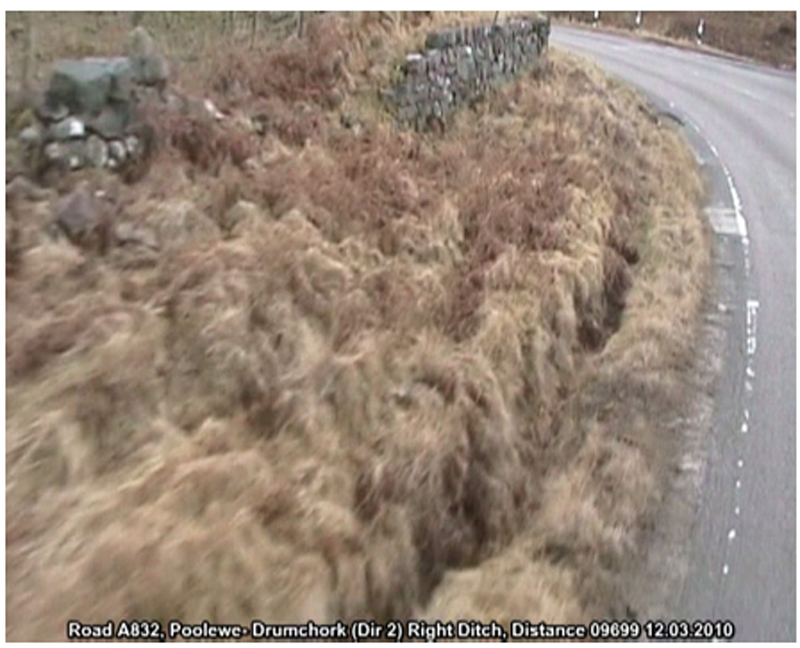 Poor access road culverts and inadequate longitudinal gradients in roadside ditches were also noted. 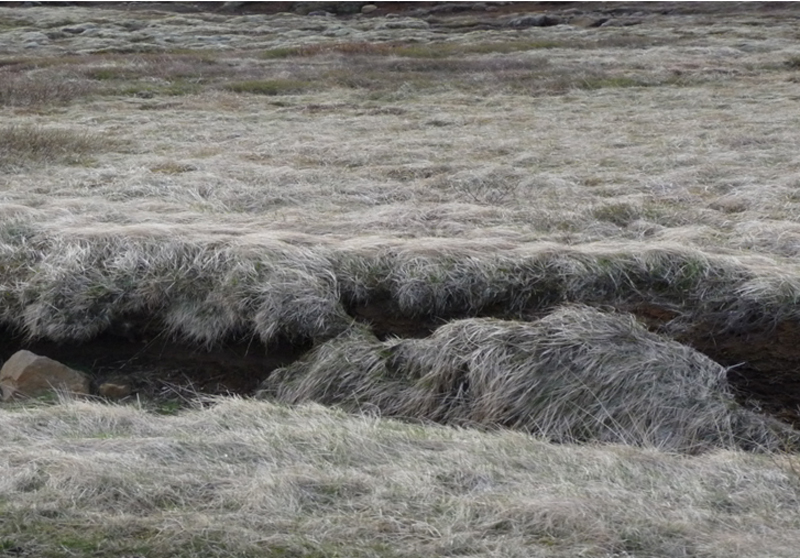 Special problem could be seen in the long road sections crossing peat bog areas in the Kittilä area. Drainage improvement was almost impossible on these sections and the only solution appeared to be in raising the grade line. 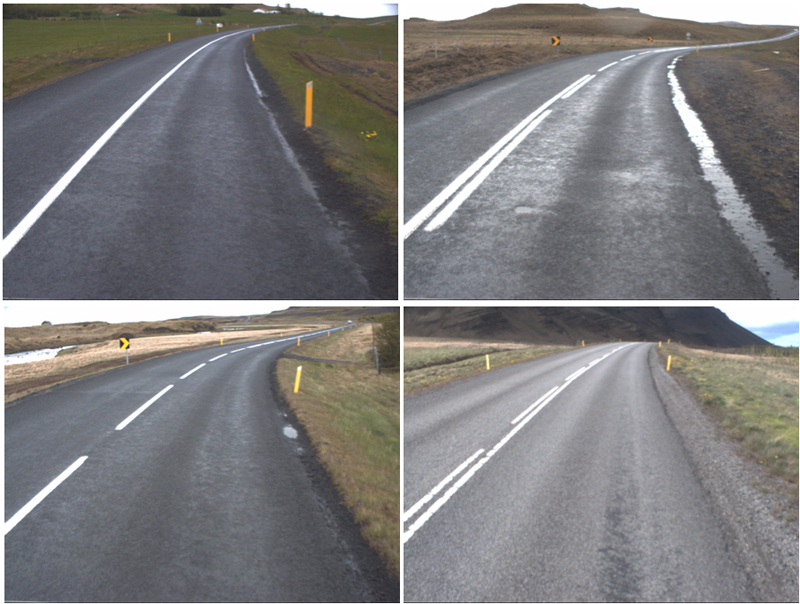 Examples of the drainage classes in used the drainage analyses in Iceland are shown in the following figures. 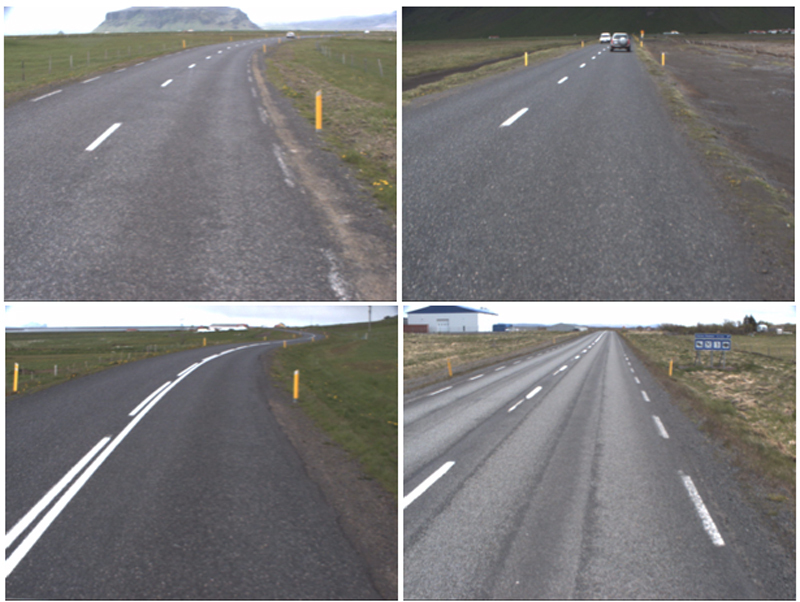 By far, the vast majority of the surveyed road sections in Iceland was classified as drainage Class 1 which covered 79% of the chain age, and only 2% of the surveyed road was classified as Class 3. 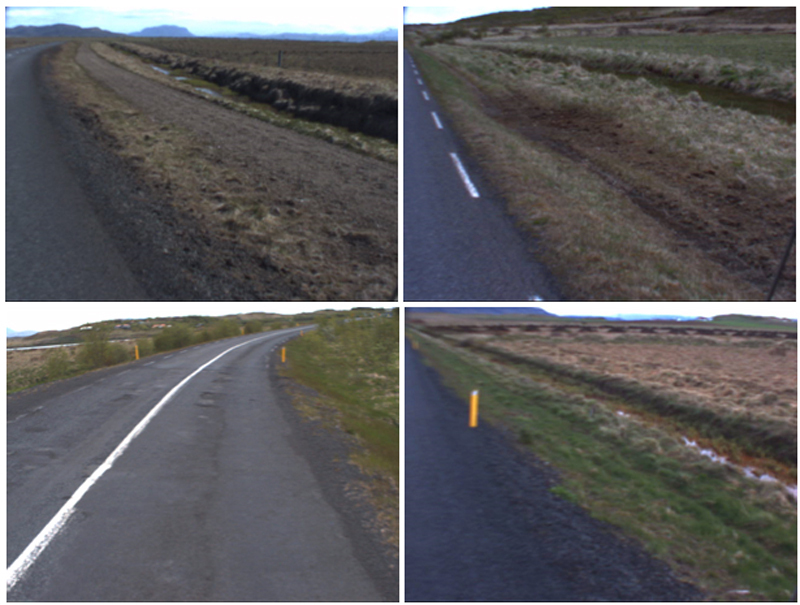 This clearly showed that the drainage condition in Iceland was on average much better than any of the other ROADEX areas surveyed. 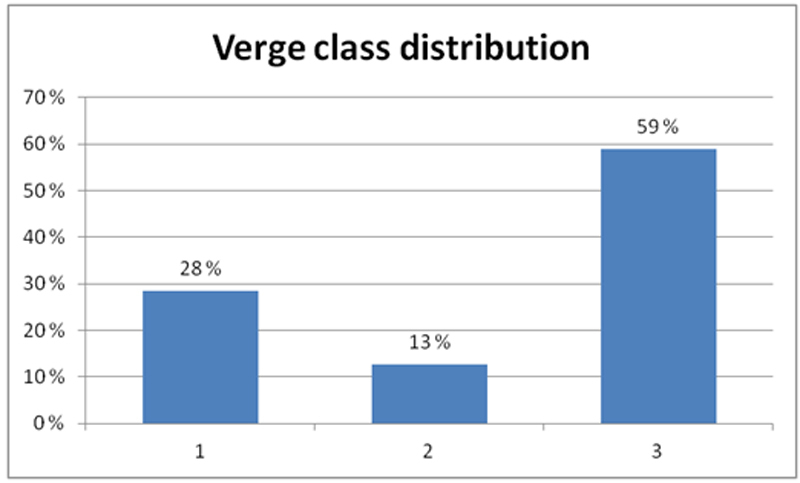 Verges were classified into two classes: Class 1 (No verges), Class 2 (Verges exist). Only 13% of the chain age surveyed had a verge and for the most part the verges were not causing problems to the drainage system. 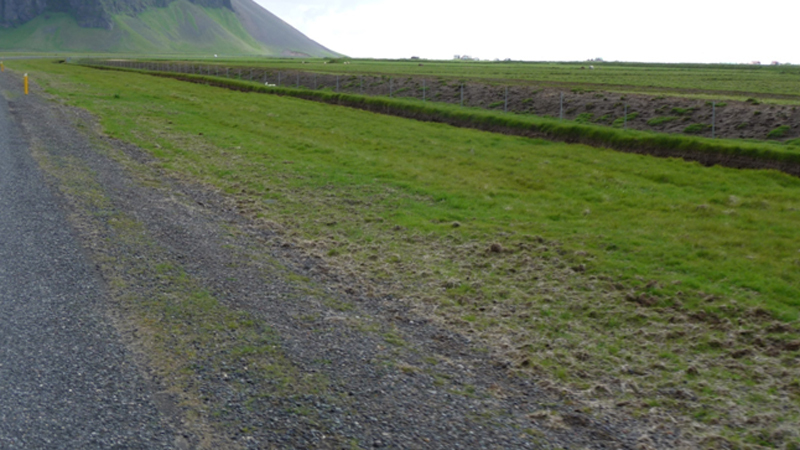 The drainage deficiencies surveyed in Iceland mainly concerned side sloping ground and flat areas. Due to the instability of the soil, ditch walls in peat areas collapse here and there, and block water flow in the ditch. Outlet ditches with standing water and lots of vegetation growth were noted in some flat areas. 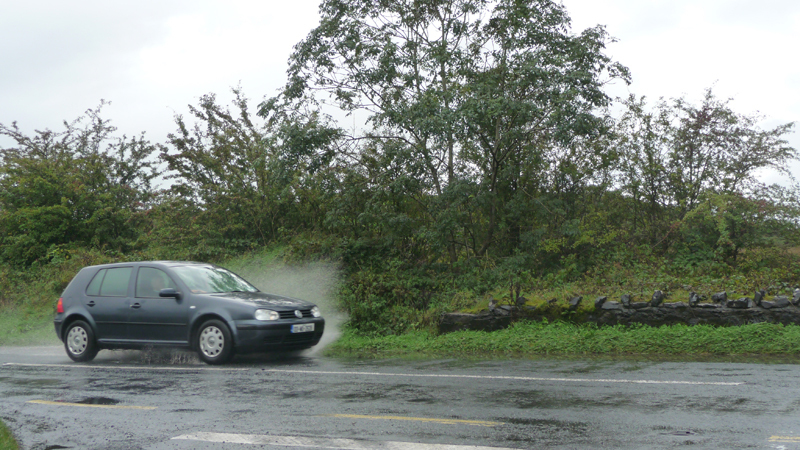 Similarly verges were preventing water flow away from the pavement on some sections. 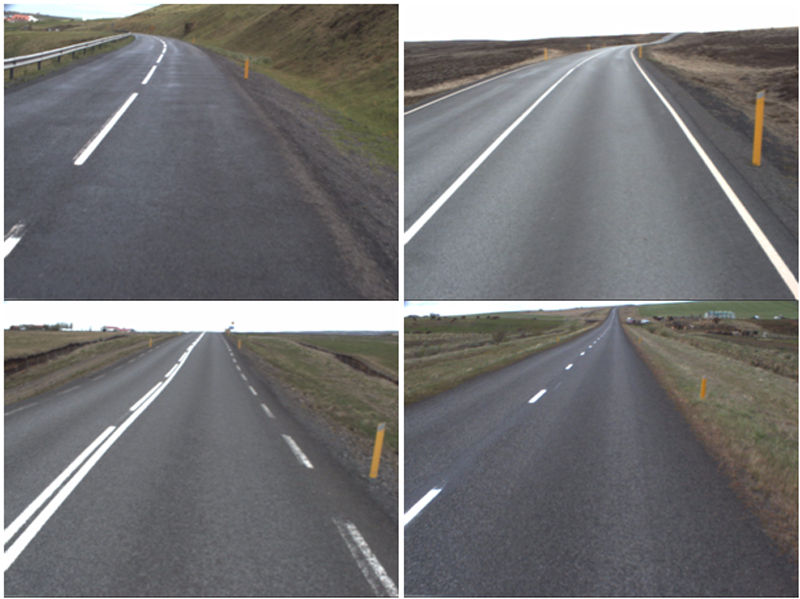 The road drainage system and local conditions on the Icelandic road network are quite different to other ROADEX projects surveyed. 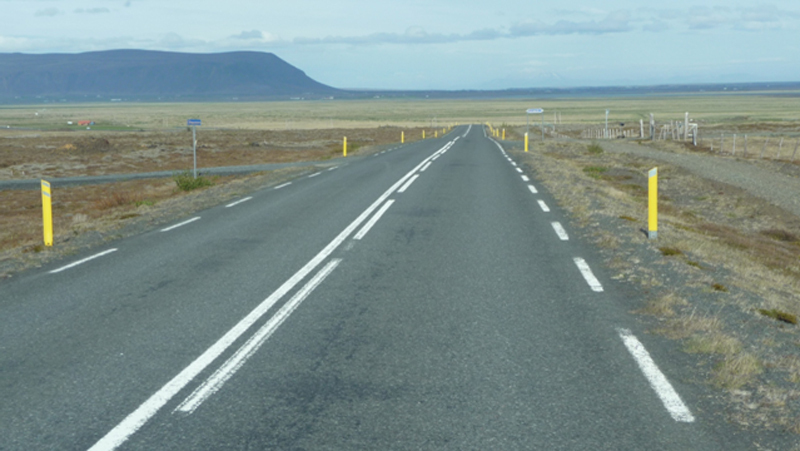 The roads surveyed were generally located on dry soil or on volcanic terrain with no drainage problems! 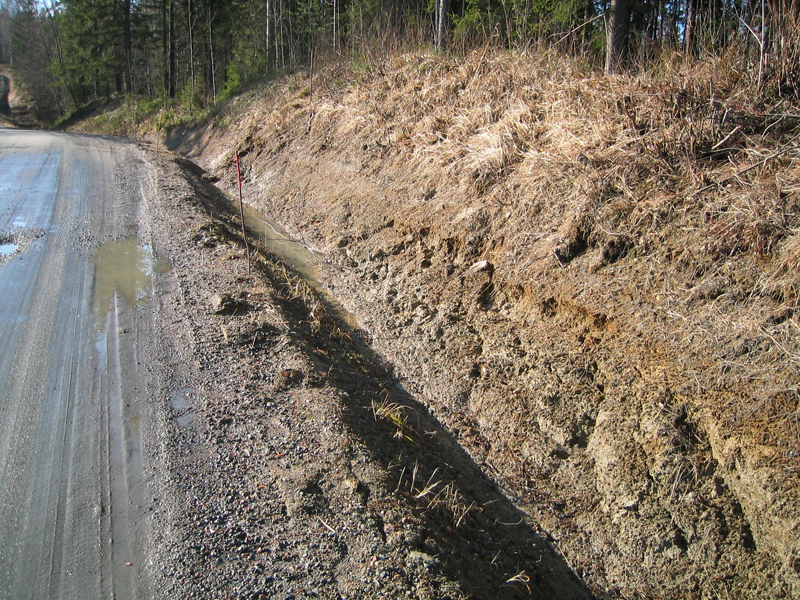 In many cases the ditches were located far away from the road (10-15m). Many road sections had horse tracks between the road and the ditch and in some cases these slowed down the water flow from the road to the ditches. 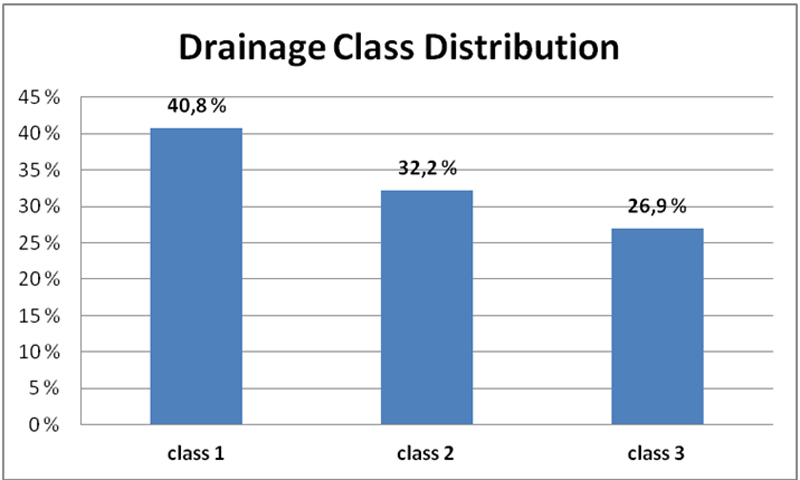 Classification and statistics: Examples of the drainage classes used in the drainage analyses in Ireland are shown in the following figures. 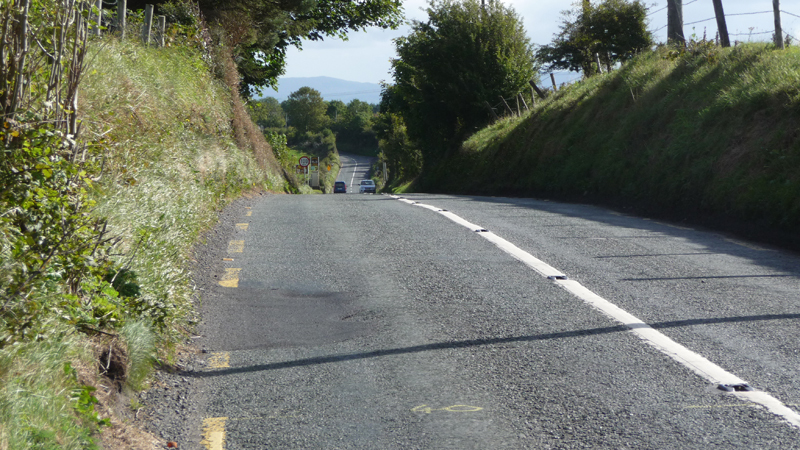 Of the two roads analyzed in Ireland, the drainage on road N56 was in better condition than that of road N59. 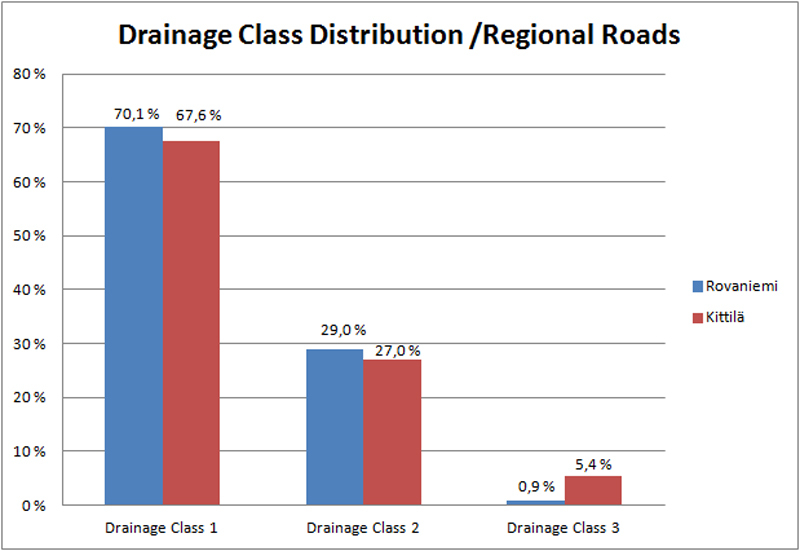 The main part (68.4%) of the drainage system on road N56 was rated as drainage Class 1, and only 8.1% of the drainage in road N56 was rated as drainage Class 3. 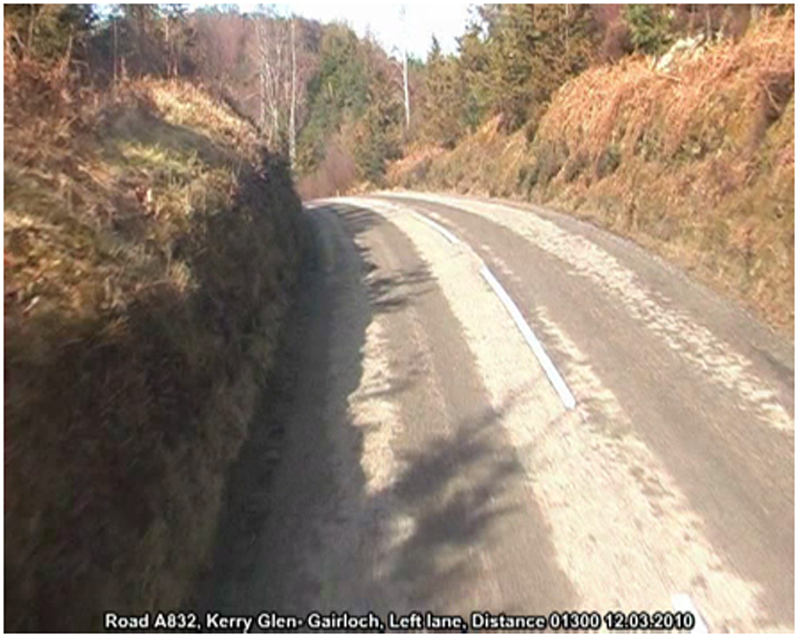 The N59 road was in slightly worse condition, only 23.7% was rated as drainage Class 1. 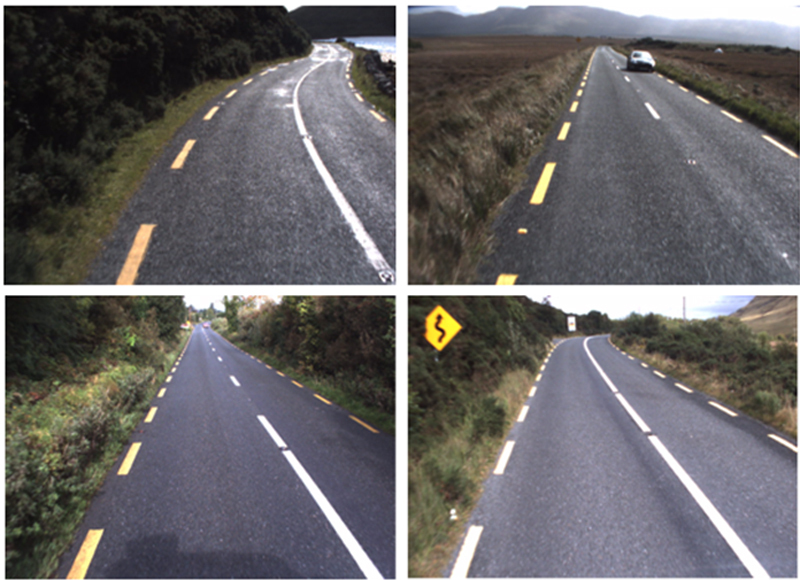 Examples of the classification of verges in Ireland are shown in the following figures. The verges were common in Ireland. 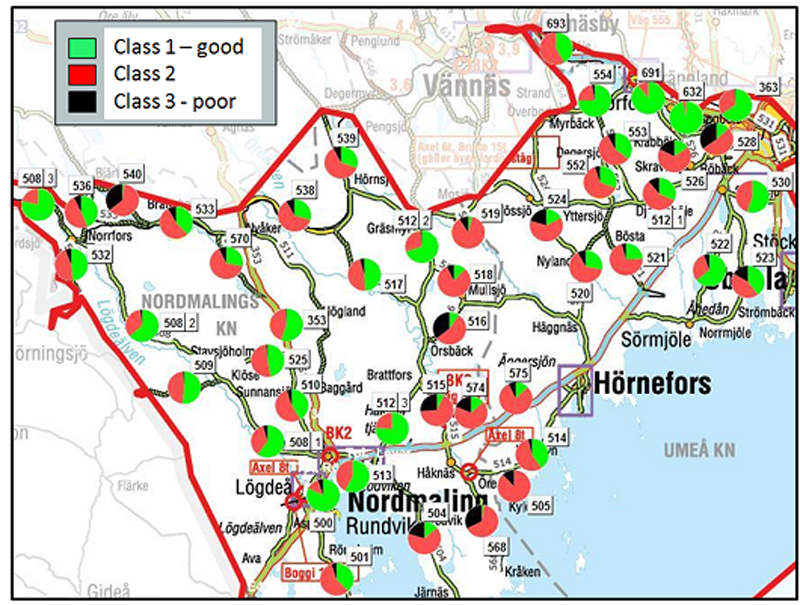 On road N56 the majority (55.%) of the verges surveyed were rated as Class 1, while 21.4% were rated as Class 3. On road N59 the 34% were rated as Class 1 and 42% as Class 3. 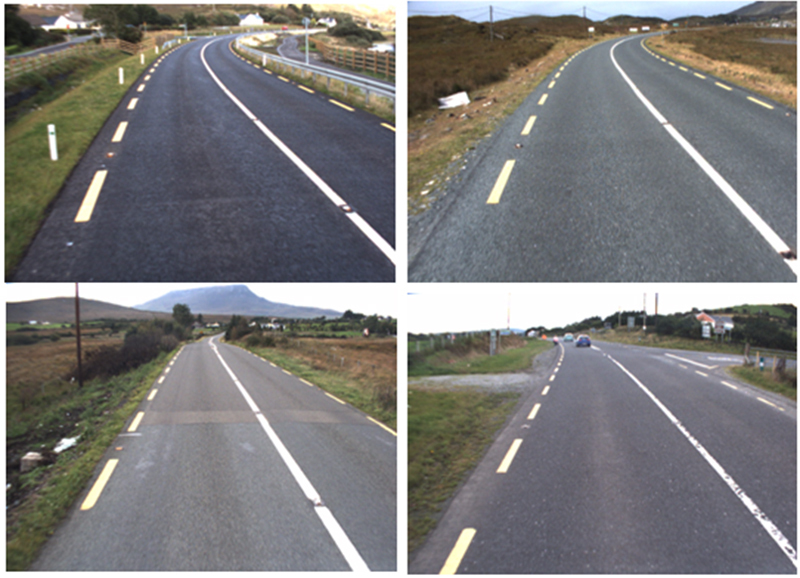 Road drainage system in Ireland differs from Nordic countries where the ROADEX drainage survey method was originally developed. 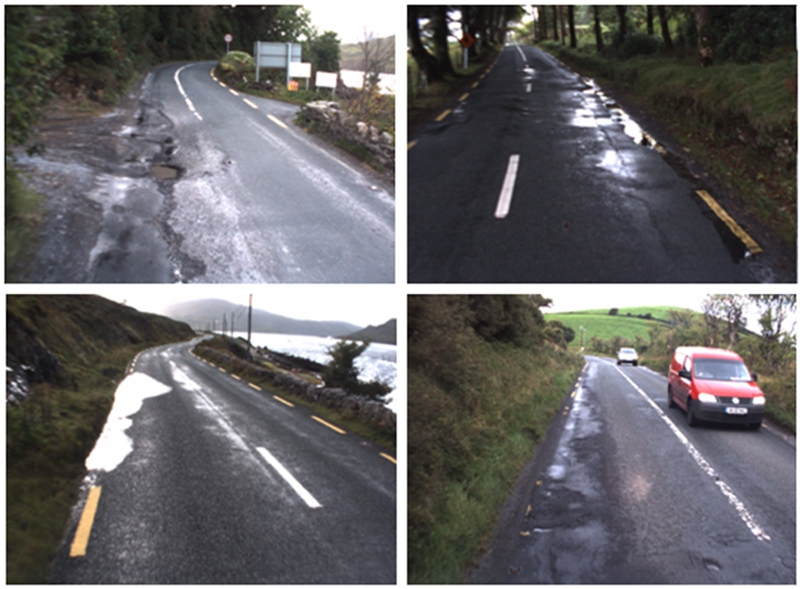 Typical drainage problems in Ireland were seen to be the result of poorly performing verges and narrow road cuts with steep slopes. 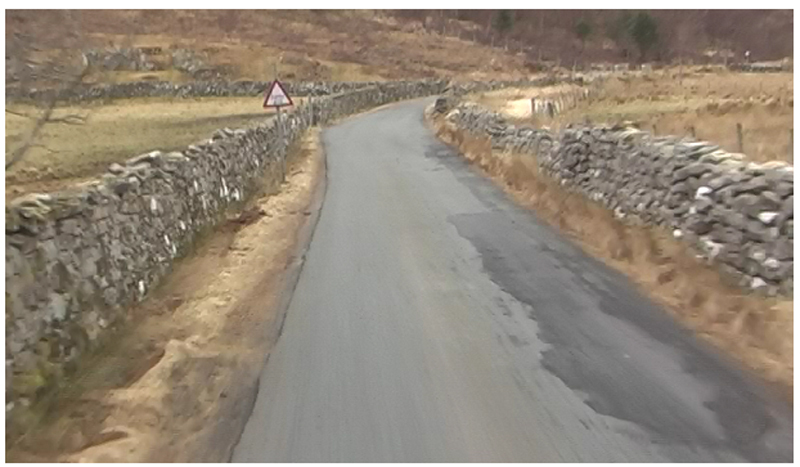 A special feature of the Irish road network was stone walls near the road. Usually these walls were located along old road sections that had not been upgraded. Where road improvements had been carried out these walls appear to have been removed. Usually these walls are very old and in many cases not visible due to vegetation growth. 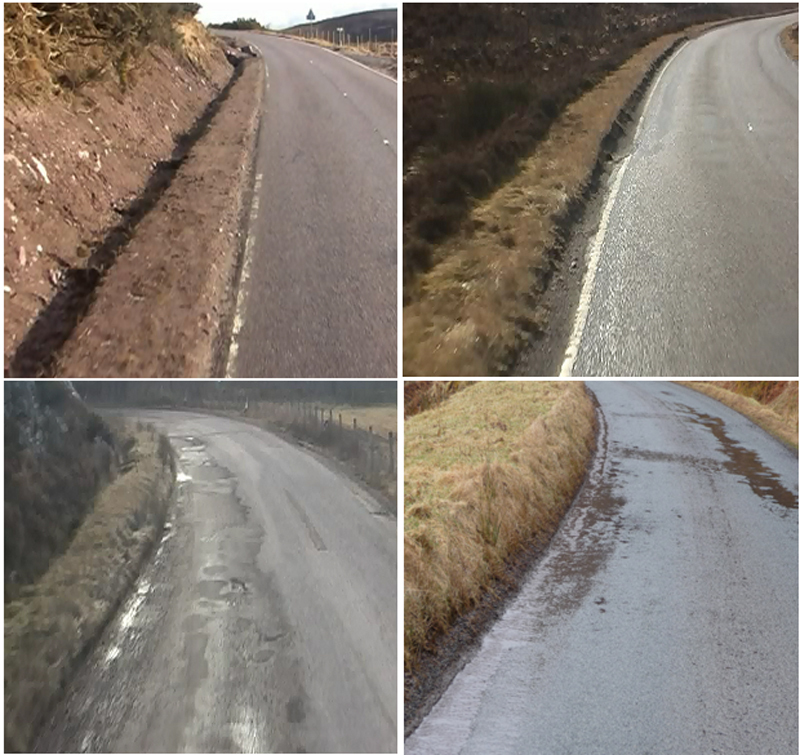 The road drainage condition and the road surface condition is generally poor in these sections. 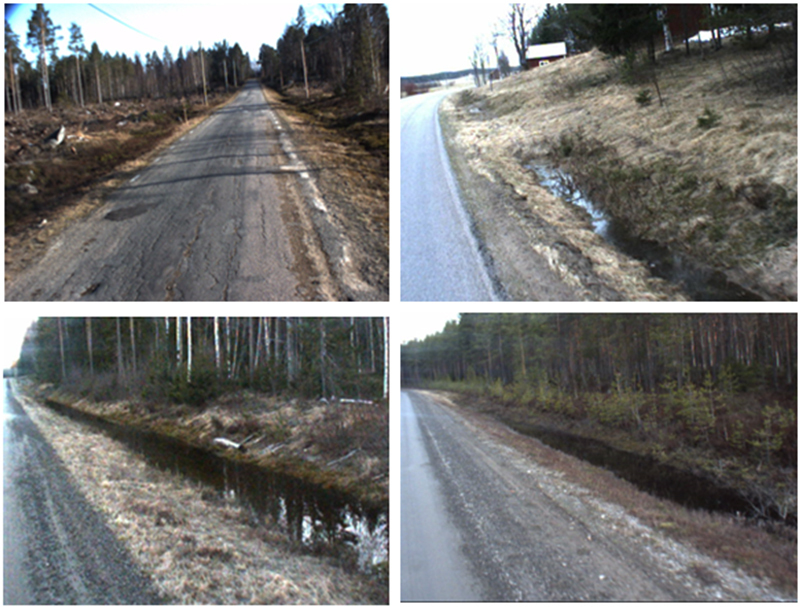 The drainage condition on the surveyed roads in Norway was divided into three classes: Class 1 (Good condition), Class 2 (Adequate condition) and Class 3 (Poor condition). Examples of these are shown in the following figures. 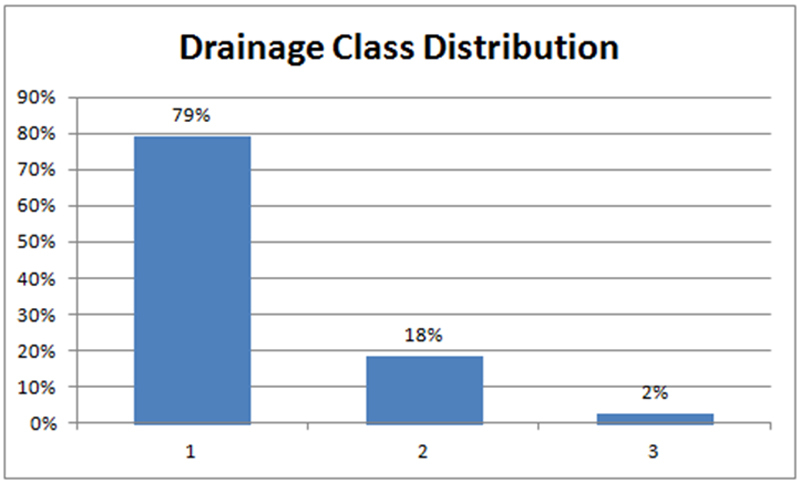 Roughly 2/3 of the surveyed road sections were classified as drainage Class 1. 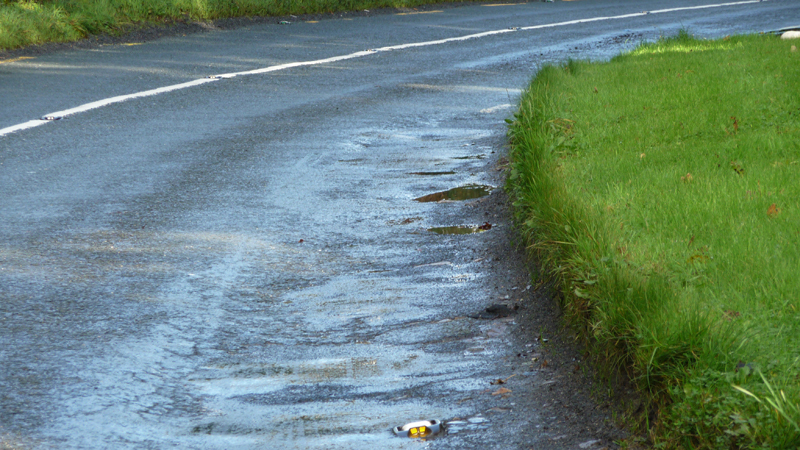 15 % of the roads however were classified as drainage Class 3, which is enough to trigger the need for a new pavement. 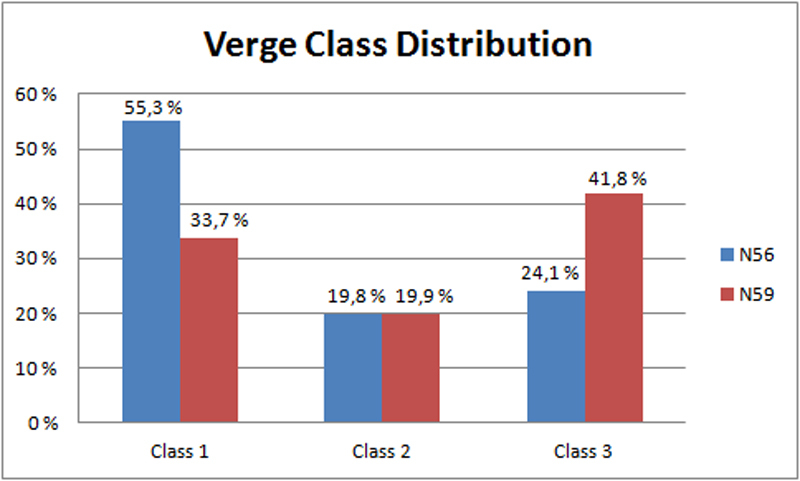 Verges were classified into two classes for analysis: Class 1 (No verges) and Class 2 (Verges exist). 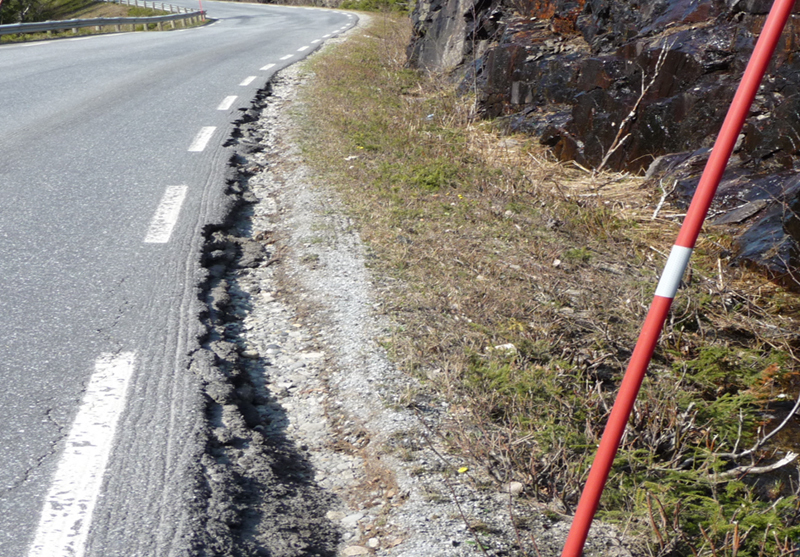 Verges were noted in 34 % of the surveyed road sections which is a fairly high number. 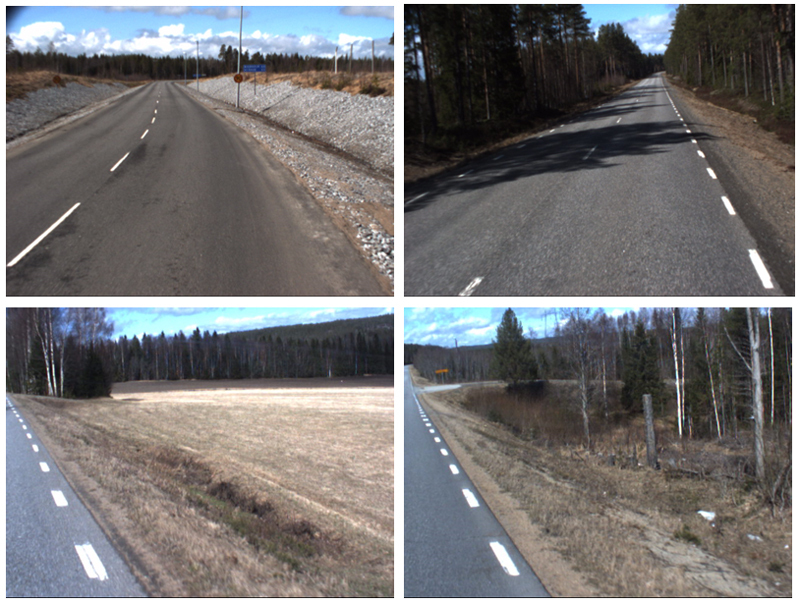 The drainage deficiencies seen in the surveyed roads were fairly typical of other Nordic countries surveyed. 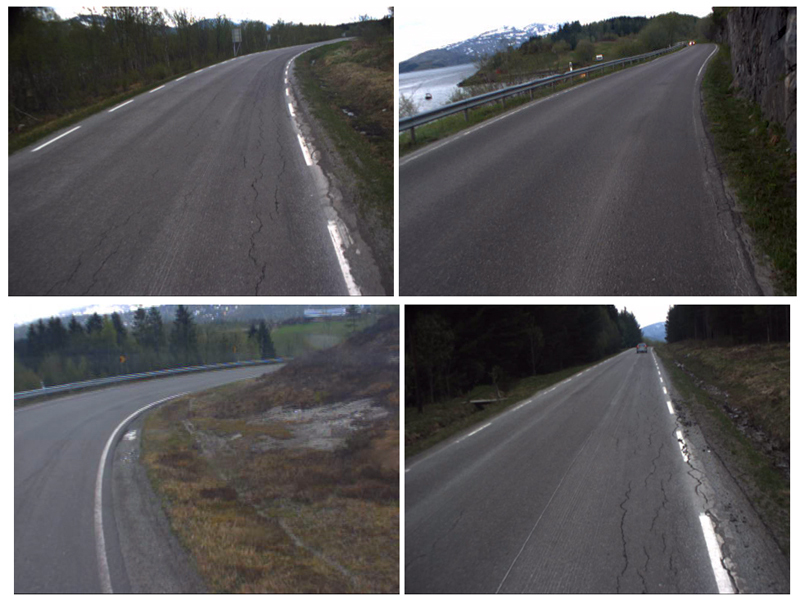 Norway is a country with fells and fjords with the result that roads are usually located on side sloping ground (72%). 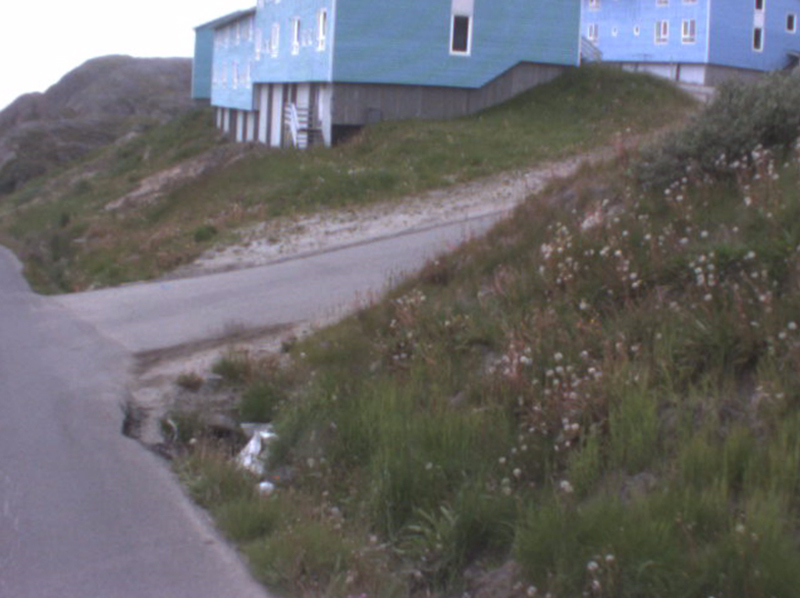 Because of the major height differences across the road cross-section the side slopes on the road cut side can be very steep. These can in turn give drainage problems if the outer slopes become unstable. 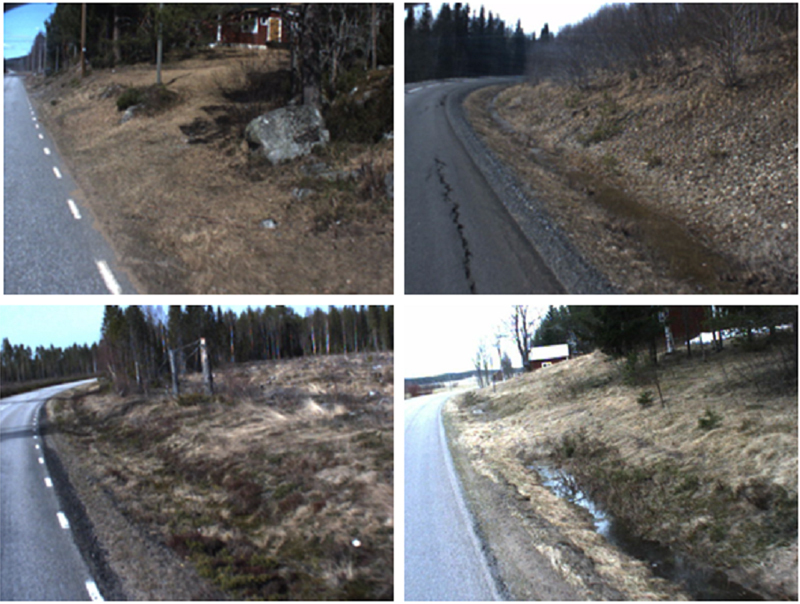 Water erosion along the edge of the pavement can be a significant problem in side sloping ground during spring when the snow is melting. 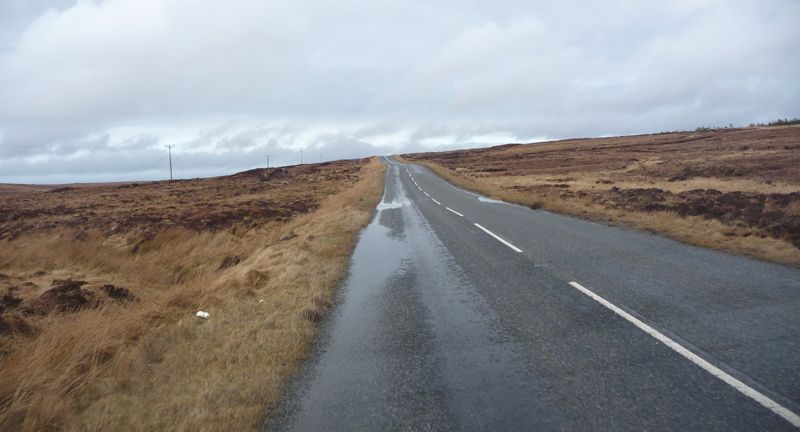 The detailed information of the drainage analyses carried out in Highland is given in the ROADEX IV report “Summary of Drainage Analysis in the Scottish Highlands”. 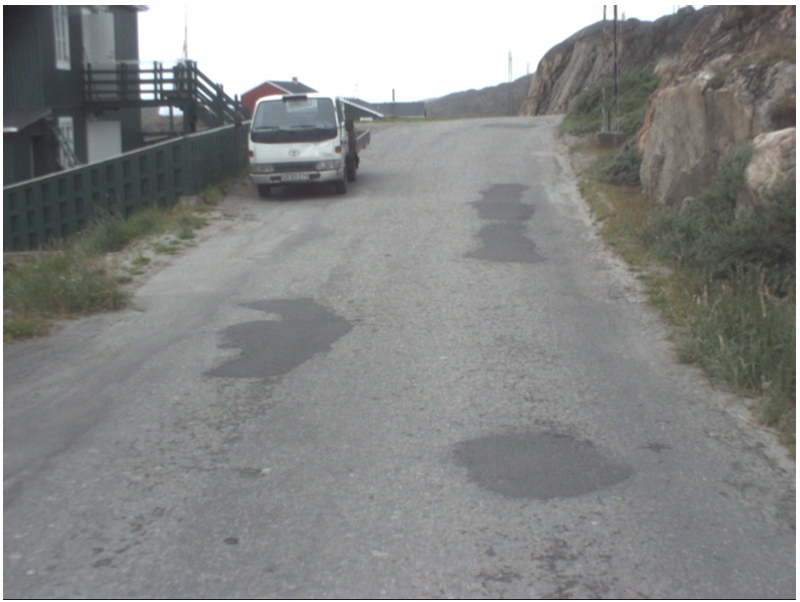 The drainage condition on the surveyed roads in Highland was divided into three different classes: Class 1 (Good condition), Class 2 (Adequate condition) and Class 3 (Poor condition). Examples of these are shown in the following figures. The statistics from the Highland area show that road drainage is a major problem. 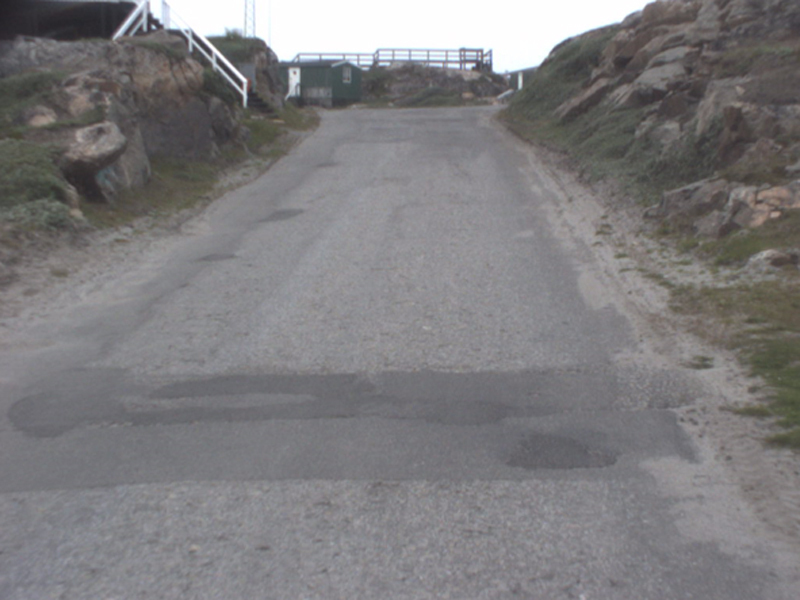 One third of the road sections surveyed were classified as Class 3, i.e. severe drainage problems, and only 17 % were in faultless condition Class 1. 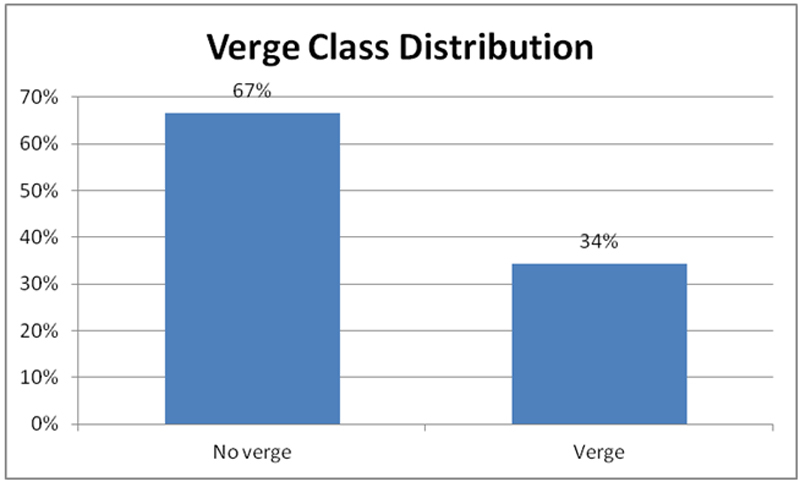 The verges in the Highland demonstration were classified into two classes: Class 1 (No verges), Class 2 (Verges exist). 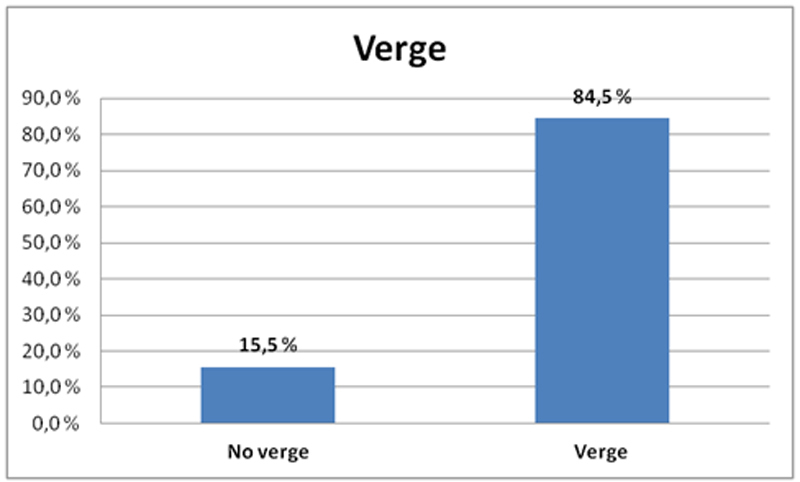 Verges were absent in only 15.5% of the surveyed sections. 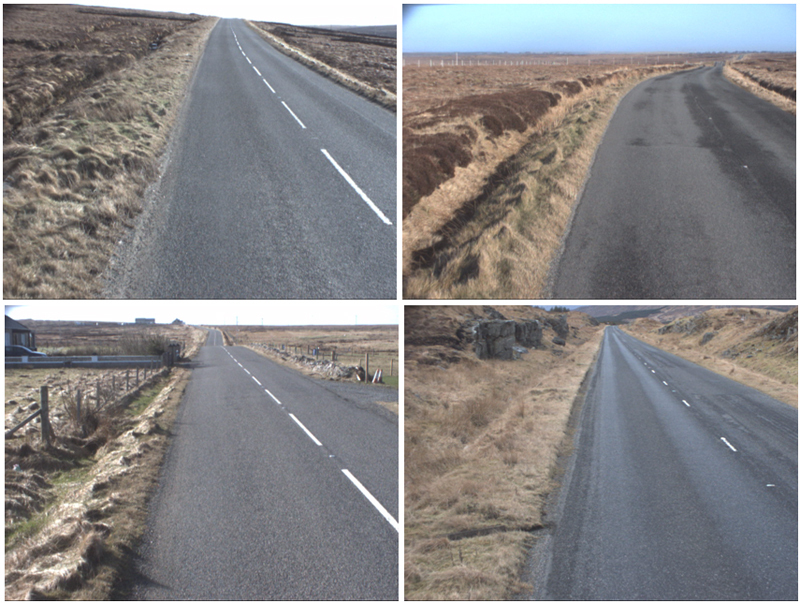 Both drainage and verge statistics clearly indicate that the average drainage in the Highland roads surveyed is in poor condition. 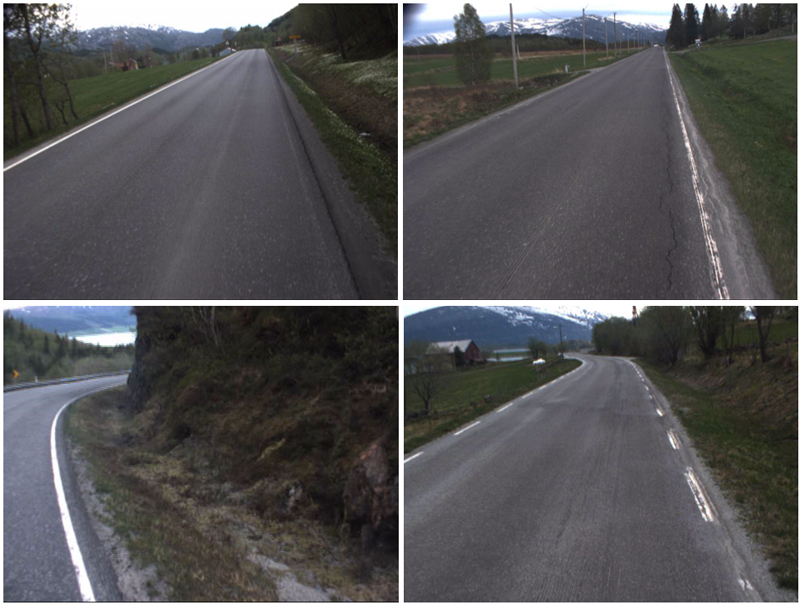 The reasons for the drainage deficiencies in Highland were generally the same as in the other ROADEX countries surveyed. 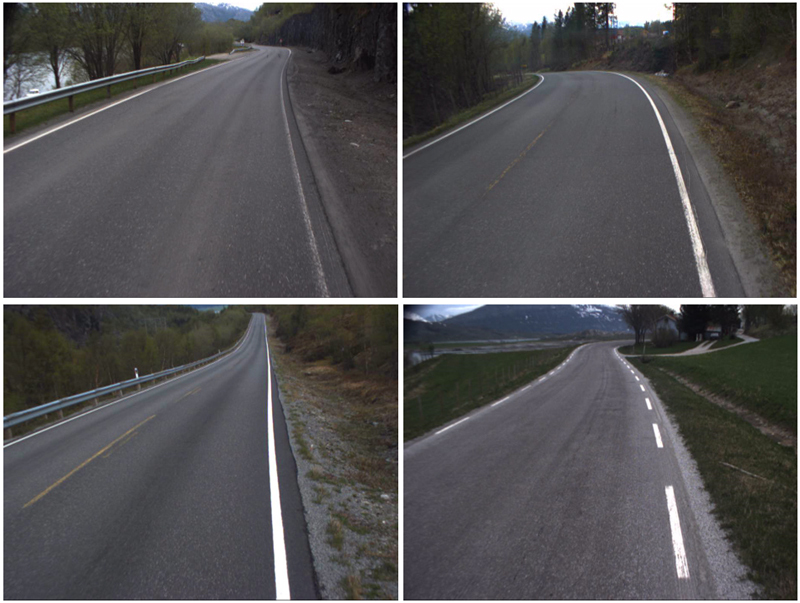 In some cases the road profile caused problems, especially on narrow road cuts and on the upper side of roads on side sloping ground. 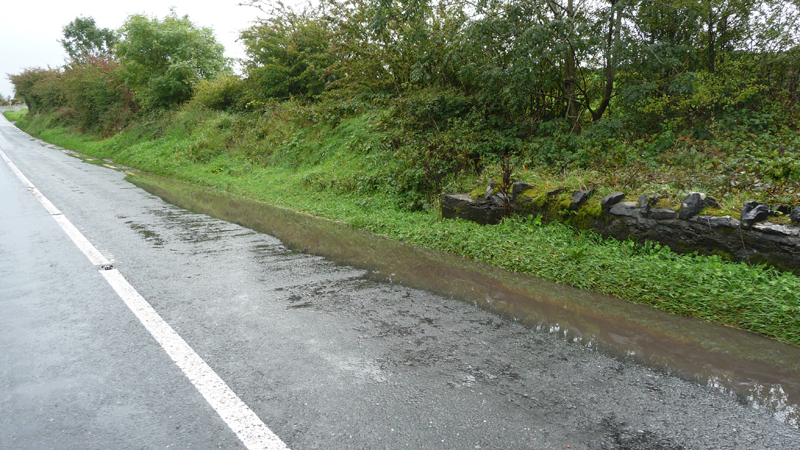 Old stone boundary walls beside the road and high verges also blocked water. The surveyed verges in Highland were quite high. 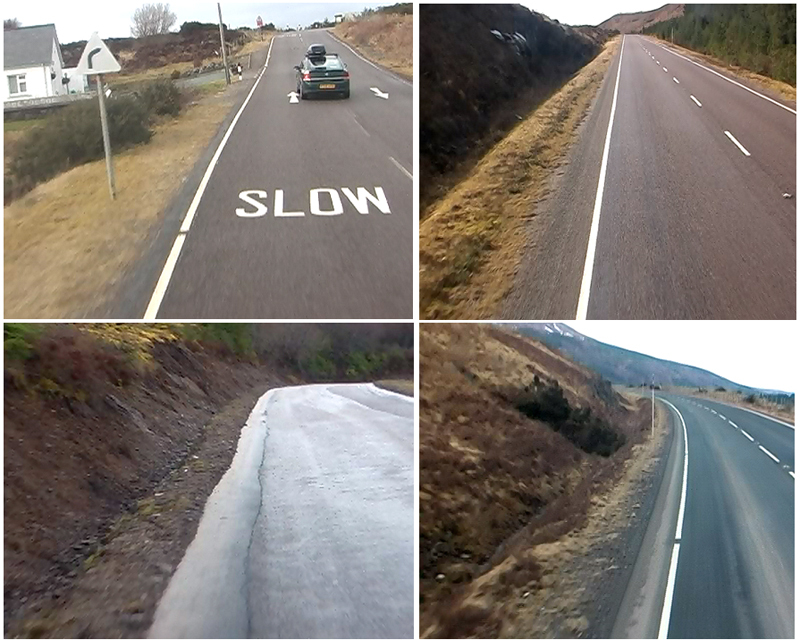 Usually roadside verges are removed during road rehabilitations in Highland, but on some sections the verges had been replaced again after the rehabilitation. 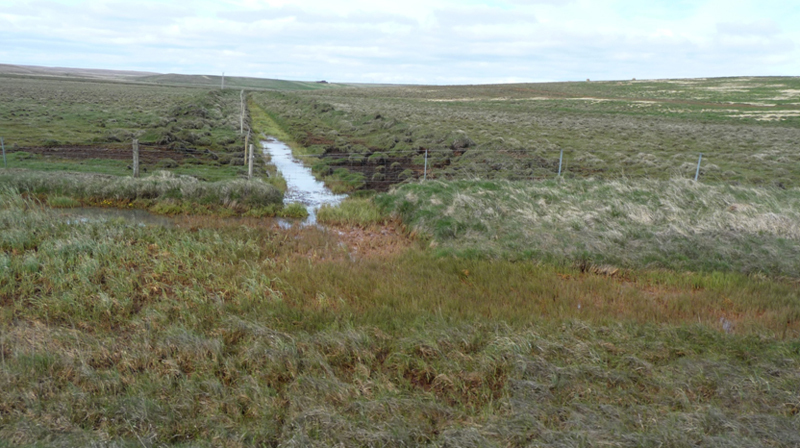 The detailed information of the drainage analyses carried out in the Western Isles is given in the ROADEX IV report “Summary of Drainage Analysis in the Western Isles, Scotland”. 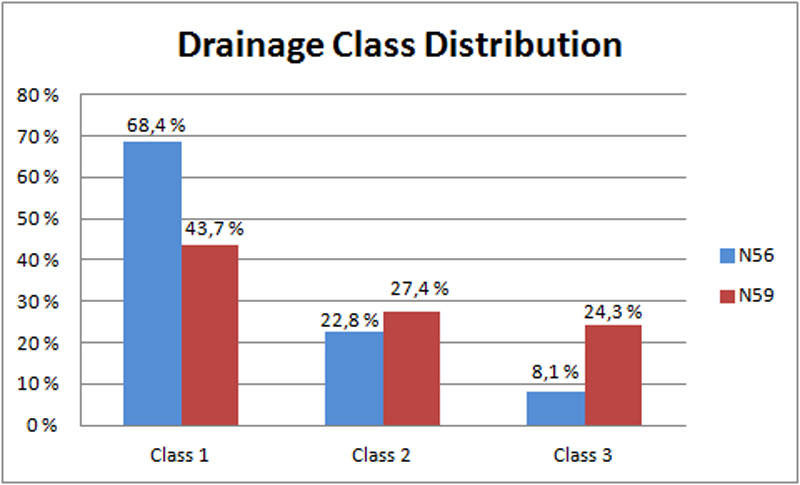 As already mentioned the drainage condition on the surveyed roads in Scotland was divided into three different classes: Class 1 (Good condition), Class 2 (Adequate condition) and Class 3 (Poor condition). Examples of these are shown in the following figures. 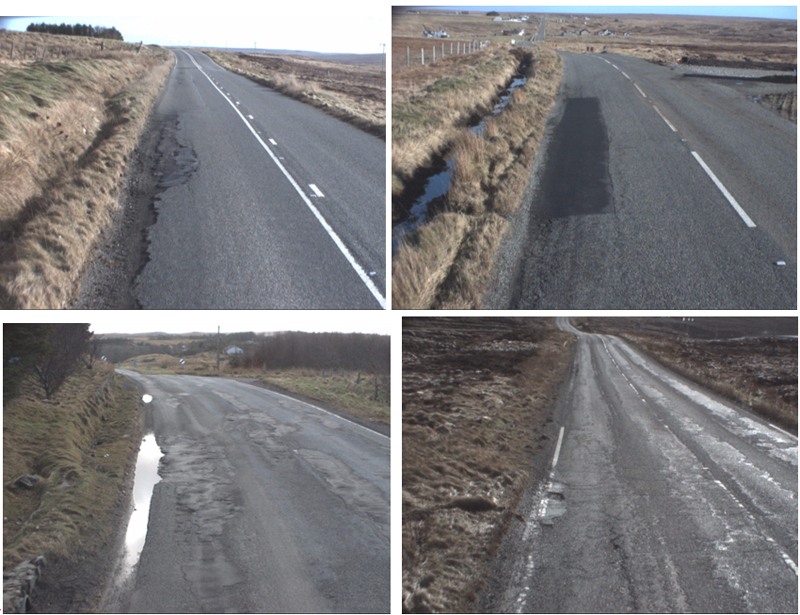 Compared to Highland, the road drainage in the Western Isles was in better shape with the majority of the surveyed sections having a drainage class of Class 1 (54%). 1/4 of the roads were however classified as drainage Class 3 which makes them critical in considering pavement lifetime. 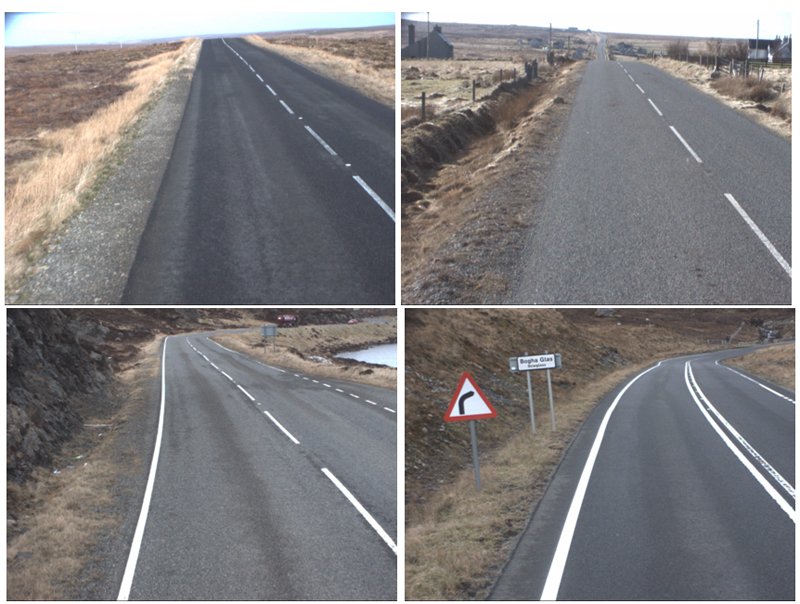 Road verges were classified into three classes for the Western Isles project: Class 1 (No verges), Class 2 (Minor verges) and Class 3 (Significant verges). 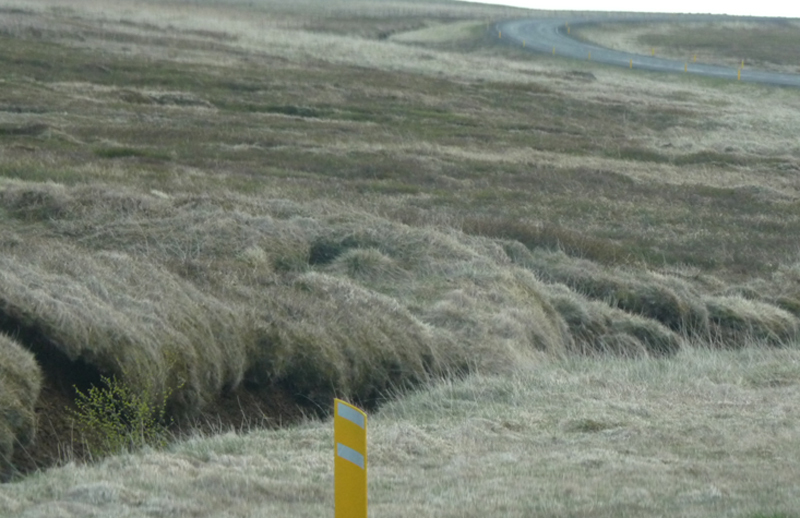 Analysis results showed that the majority of the road network in Western Isles had verges. 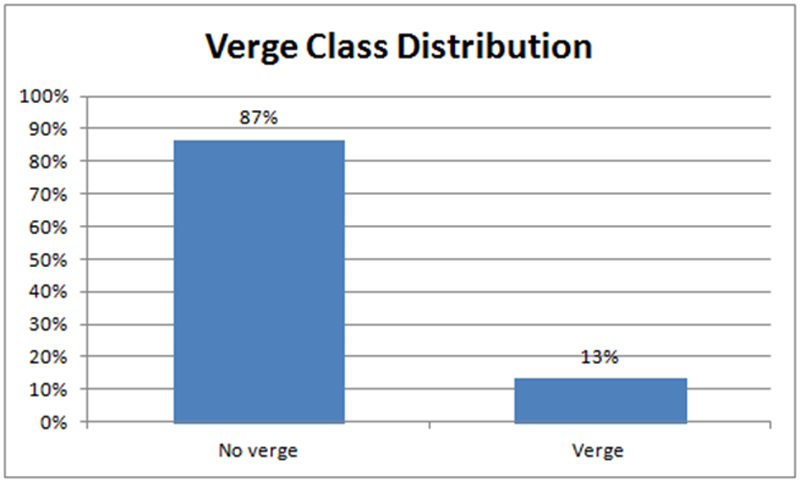 The main verge class was Class 3 (59%). 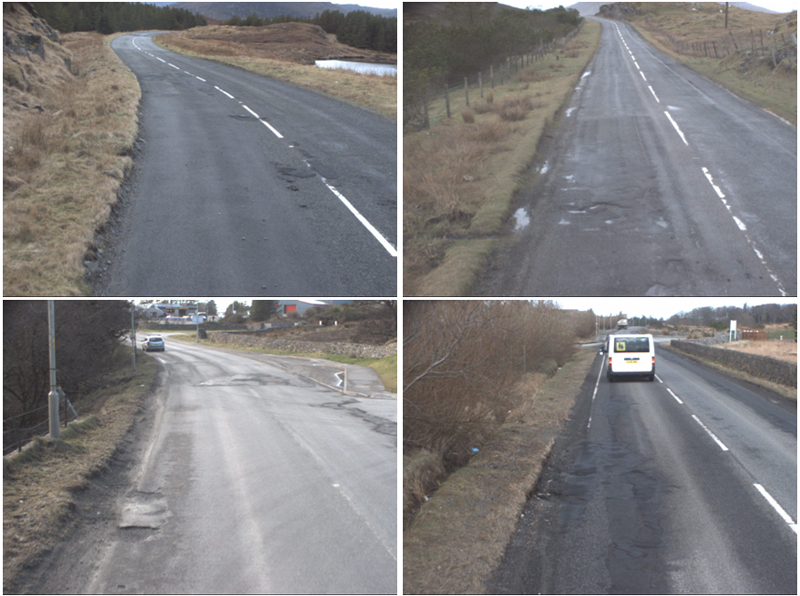 The main difference in the road sections surveyed in the Western Isles, compared to those of the Nordic countries surveyed, was that in the older road sections verges were still common and were causing problems. 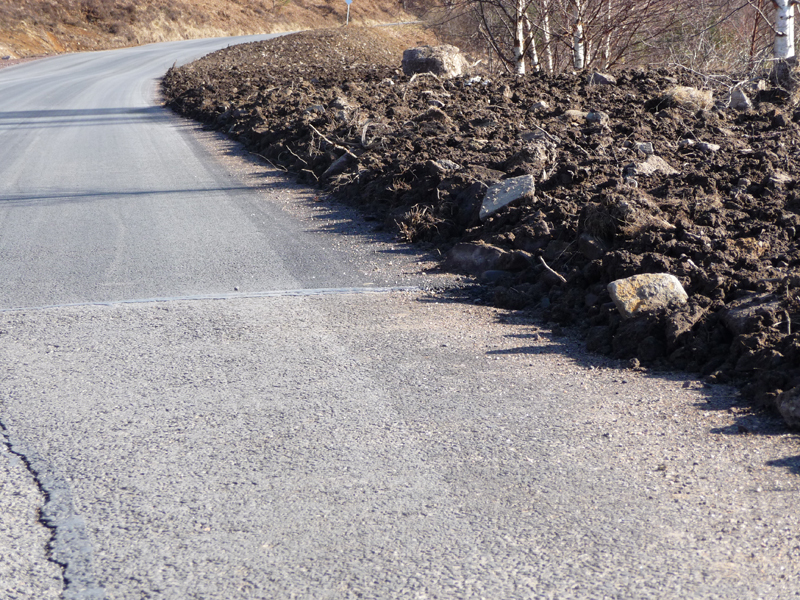 The presence of telecommunication and other cables placed inside the verge makes the removal of such verges more difficult and more expensive than normal verges. Quite often the verges did not have sufficient offsets or the existing offsets were not open. Some of the concrete offsets were broken. The drainage condition in the recently upgraded road sections was generally good: ditches were deep enough and verges had been removed. Stone boundary walls beside the road were blocking water flow away from the road. 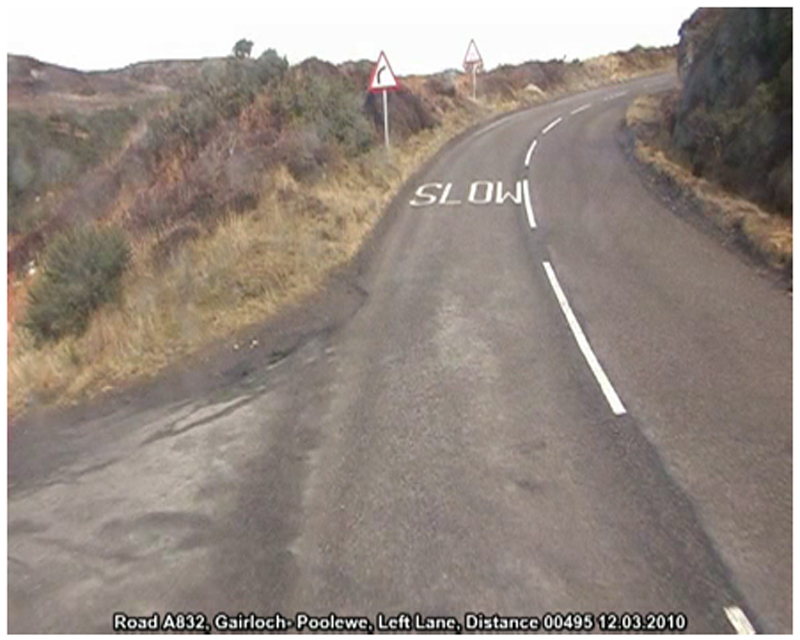 There were long bare treeless road sections built on peat. 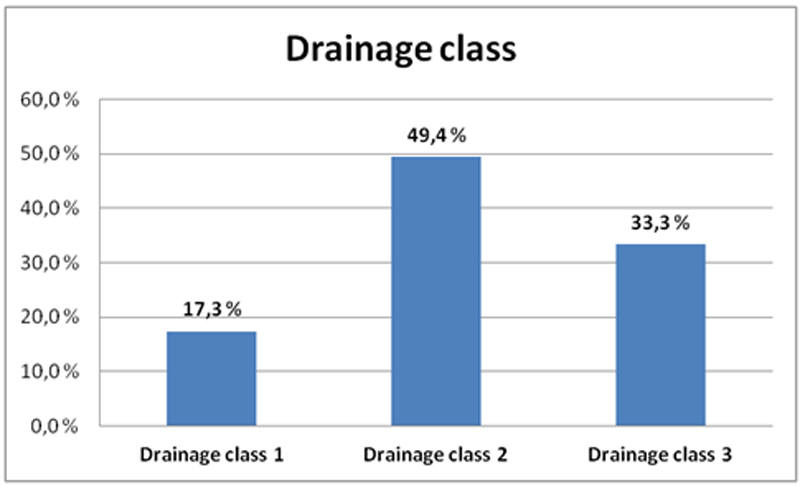 Examples of the drainage classes used in the drainage analyses in Sweden are shown in the following figures. 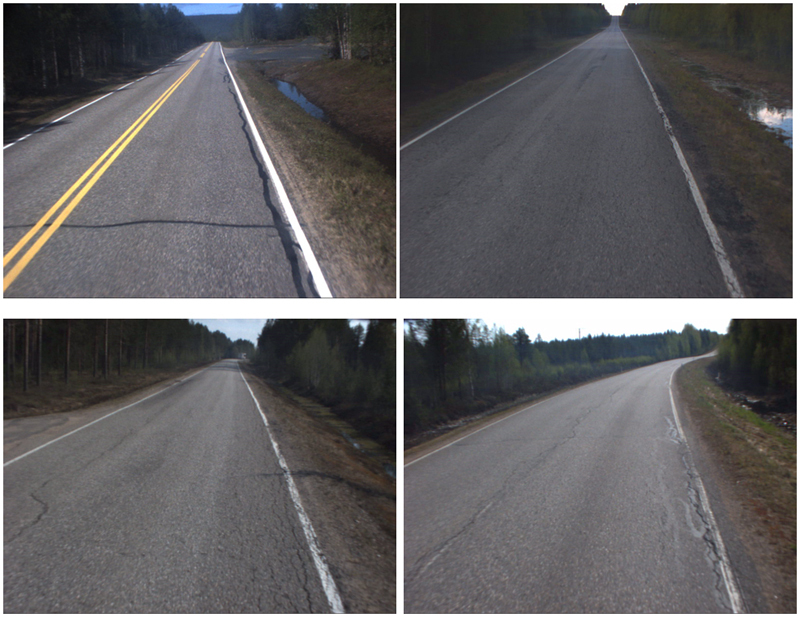 The analysis classified the main part of the roads surveyed as drainage Class 1. The drainage of Road 540 in the North-East seemed to be in the poorest condition (mainly Class 2 and 3) and the roads in the North-West area (363, 632 and 691) were in the best condition (mainly Class 1). These roads were located mainly on sandy subgrades. The biggest drainage problems were seen on flat and even areas, where water was standing in the ditches. Outlet ditches in flat field areas did not have any gradient and, as such, water did not flow away from the road area. 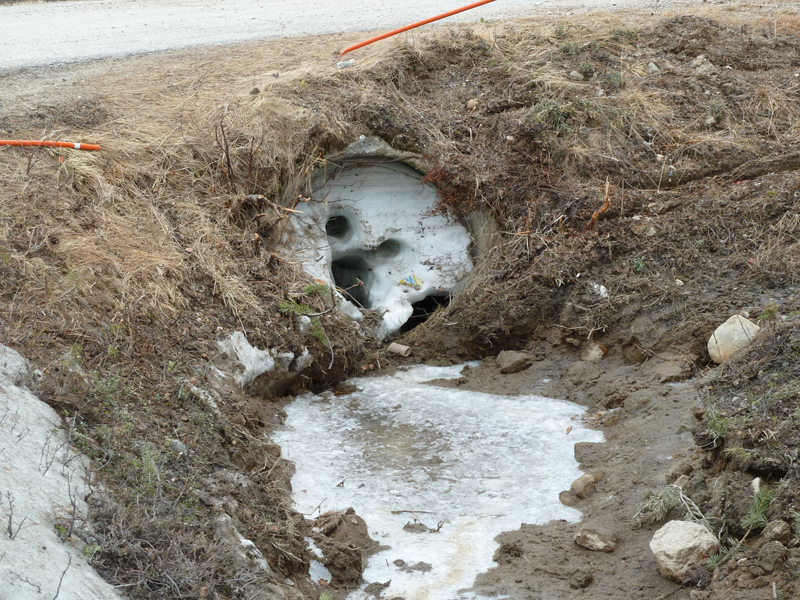 Missing or clogged private access road culverts were typical drainage problems. Private houses and lands close to the road also caused problems due to the limited space for ditches or drainage improvement. 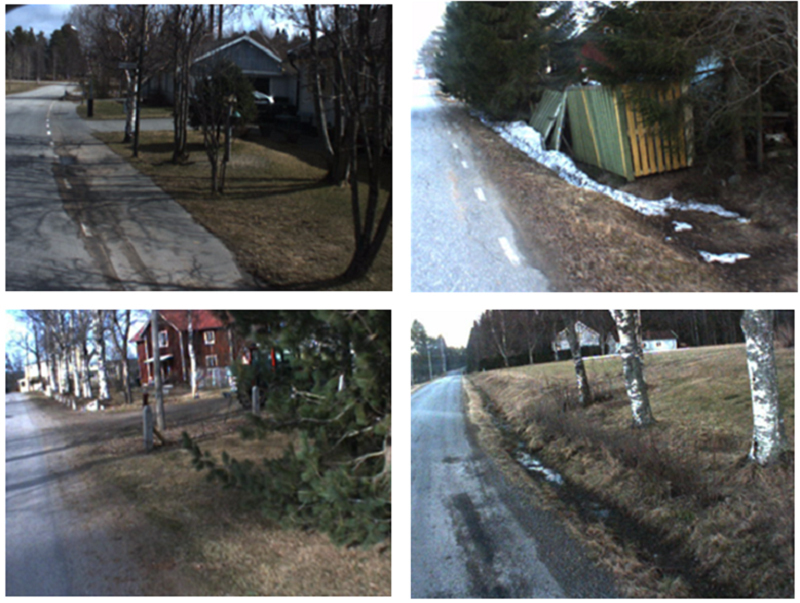 Umeå Södra maintenance area in Sweden was the first demonstration project where thermal camera and laser scanner were tested to support drainage analysis. Both techniques gave promising results, especially the use of laser scanners. It is expected that this will have great future in drainage analyses and follow up surveys, and also in the control of ditch clearing.